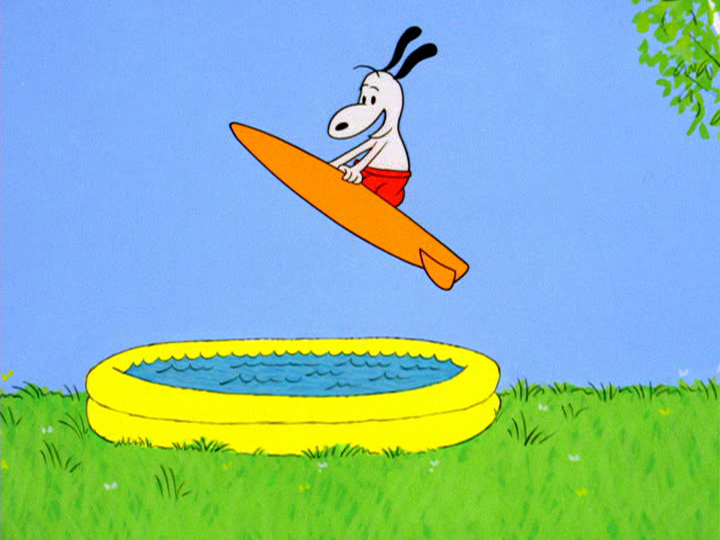 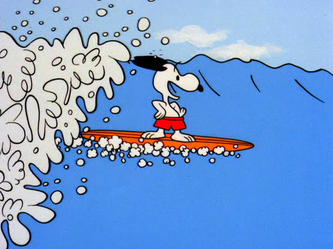 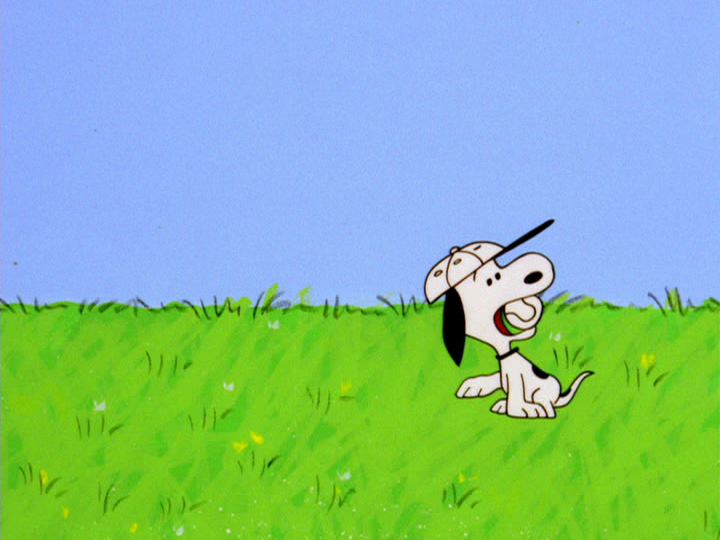 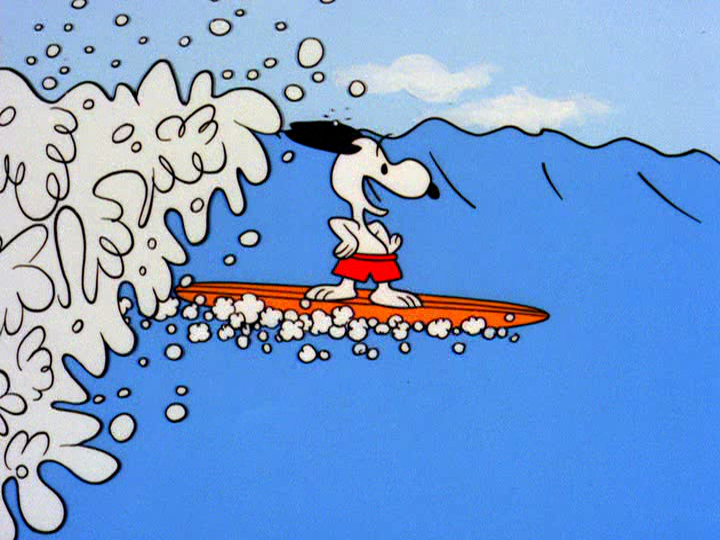 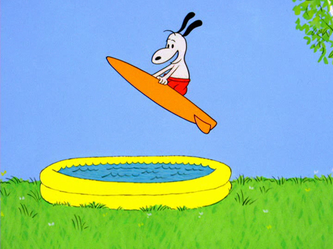 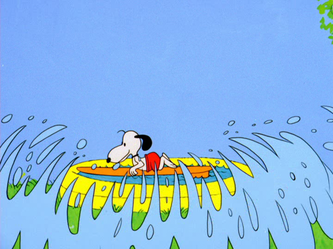 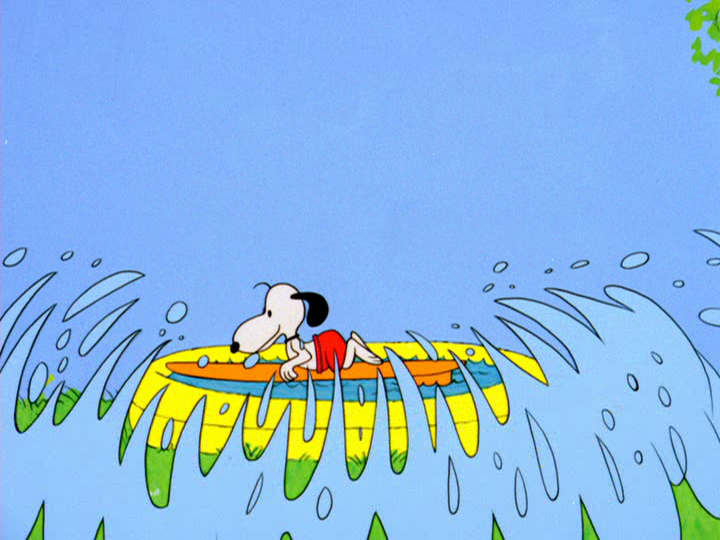 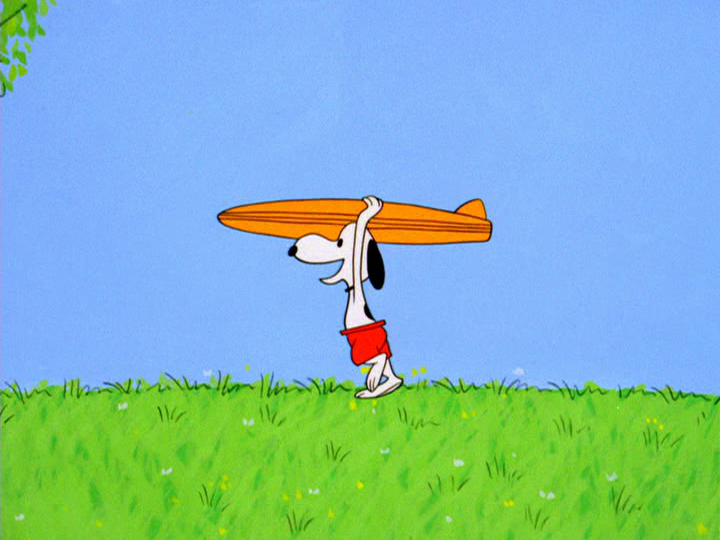 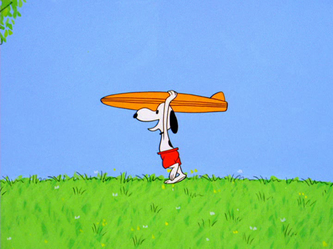 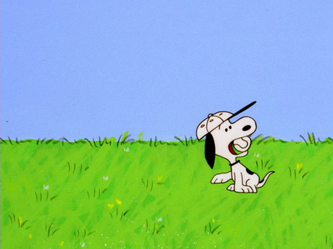 Specials 53 - Snoopy And The Gang! 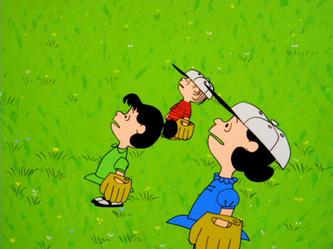 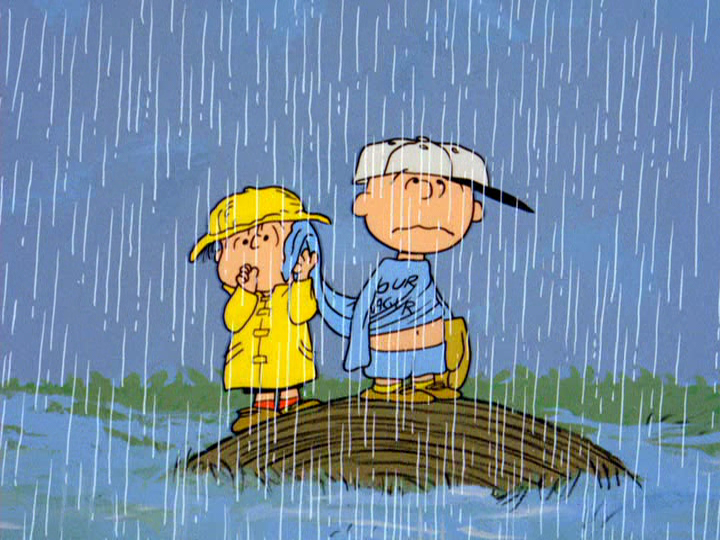 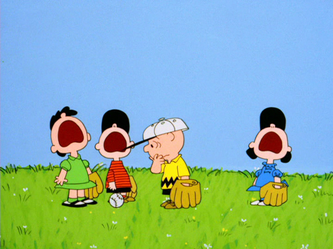 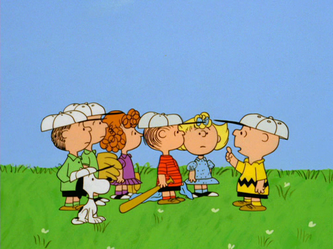 Baseball season has begun, and as usual, the gang starts off by losing. 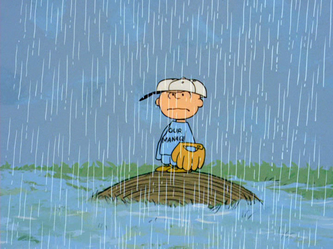 Practices don't go well, either. 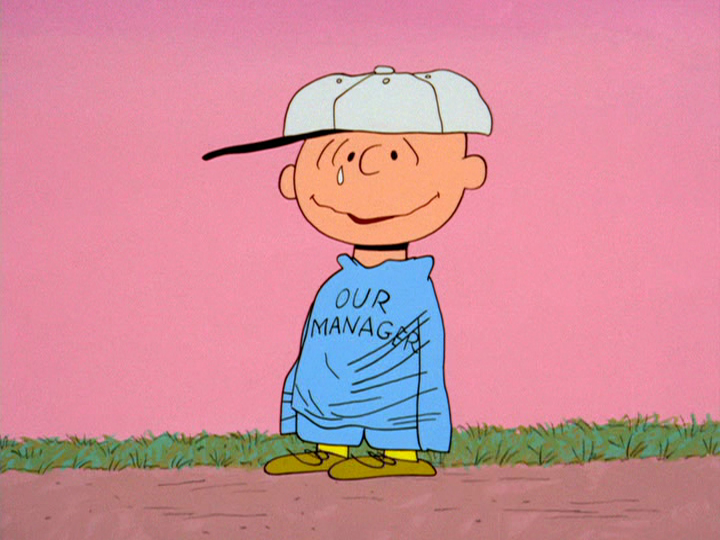 The team then decides to quit. 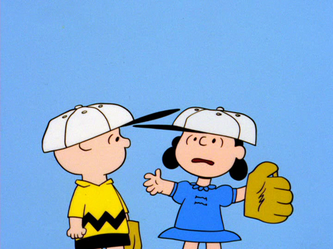 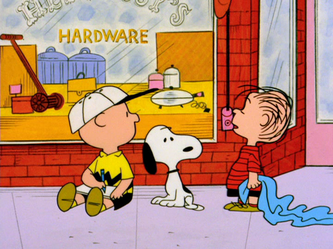 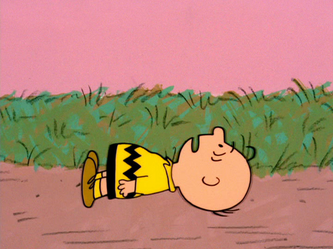 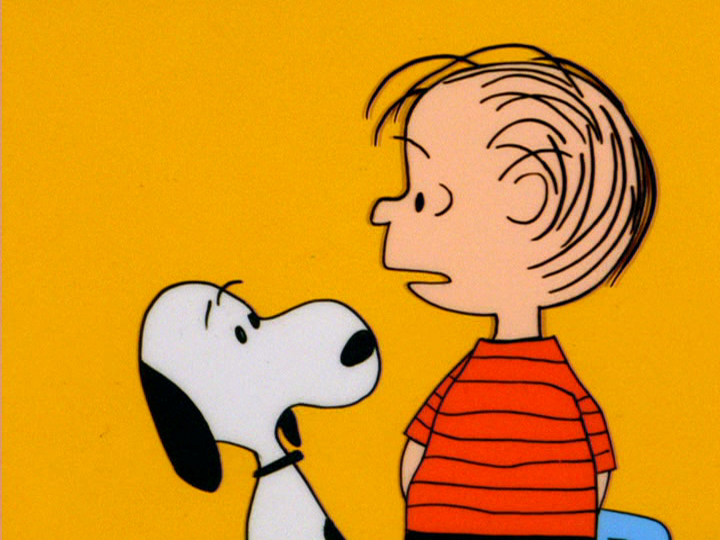 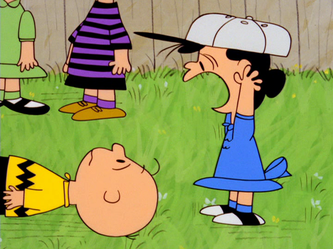 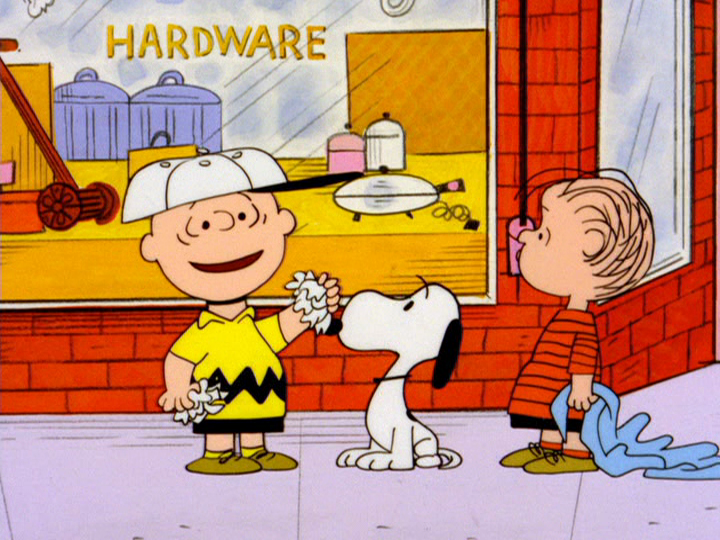 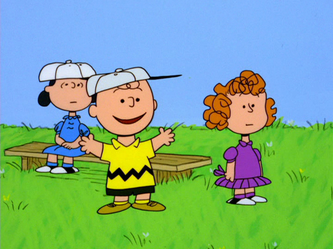 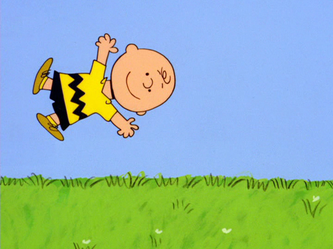 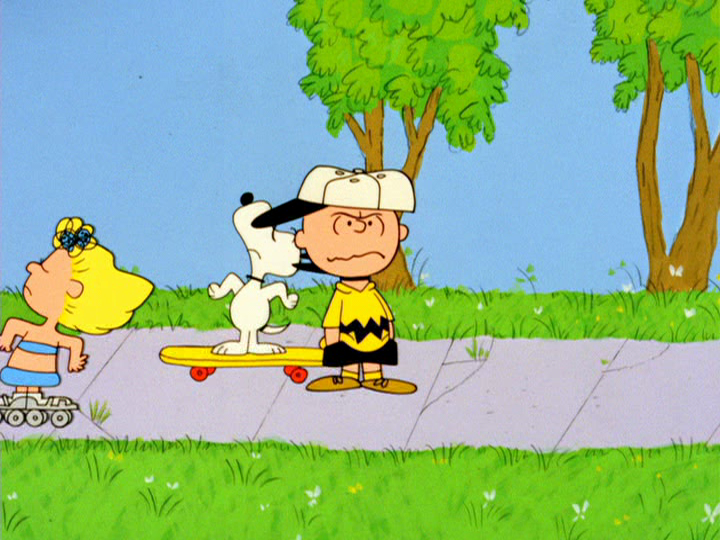 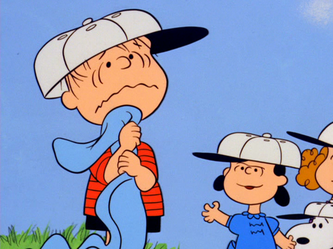 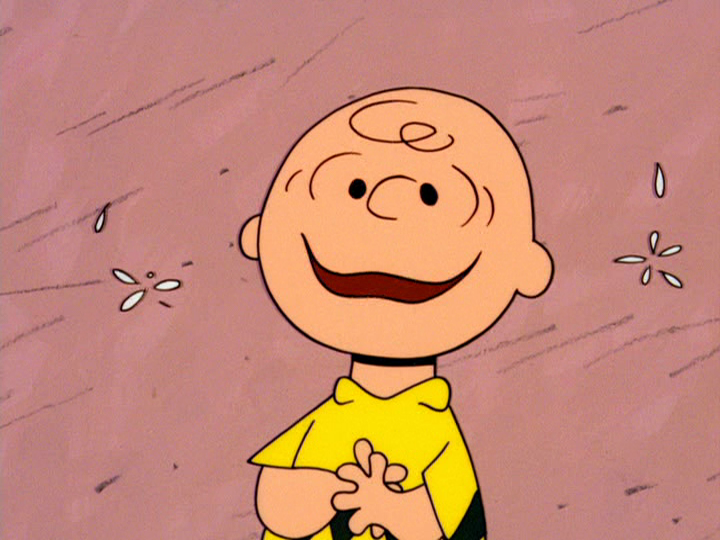 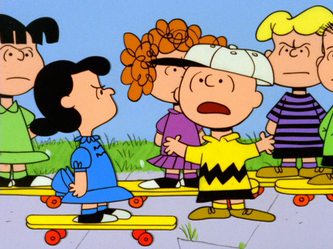 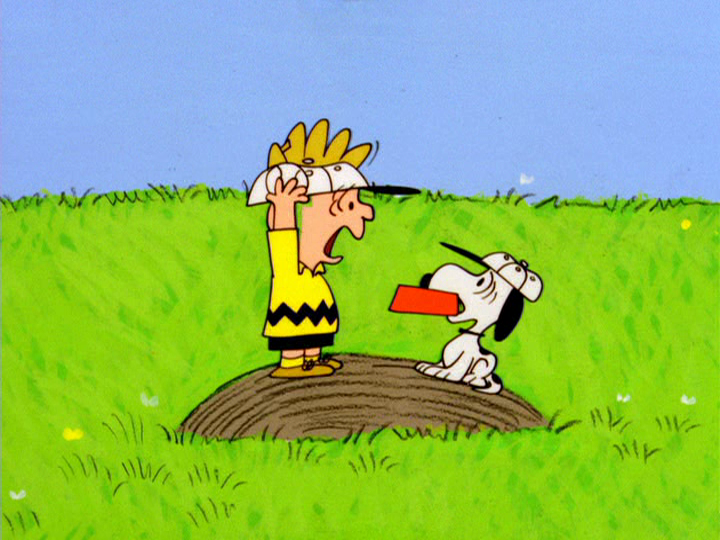 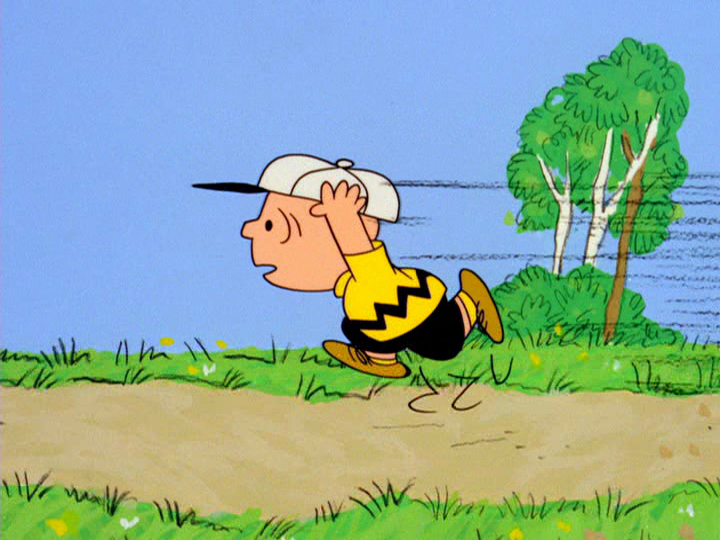 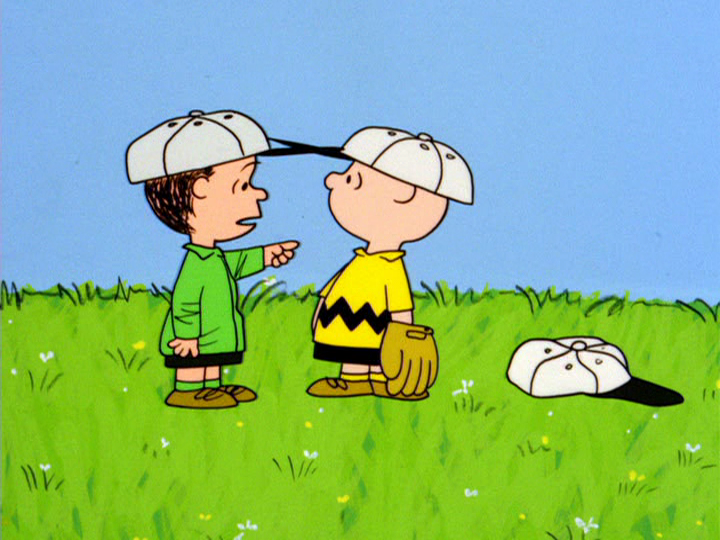 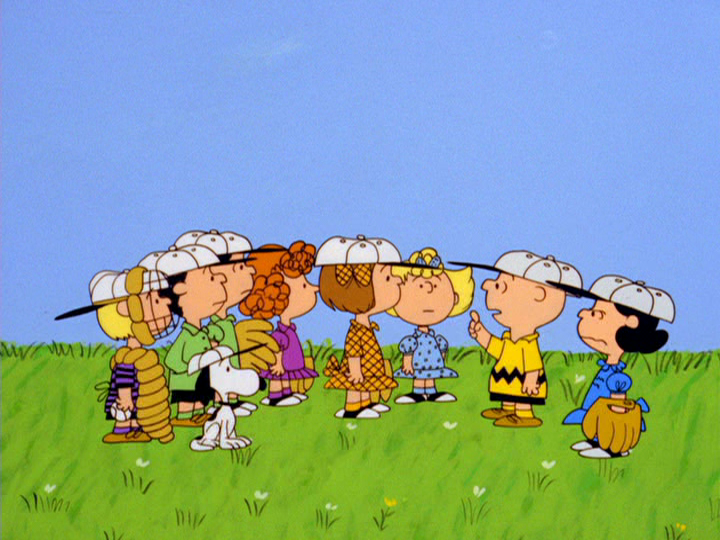 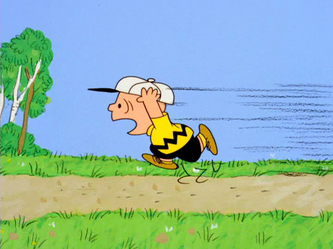 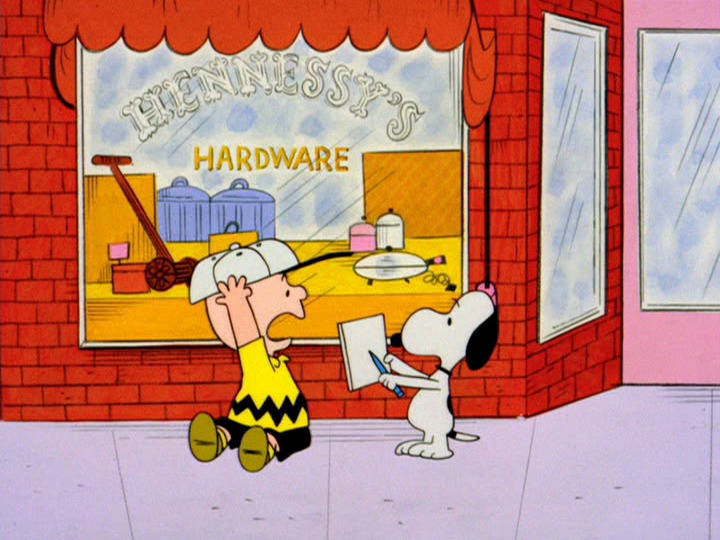 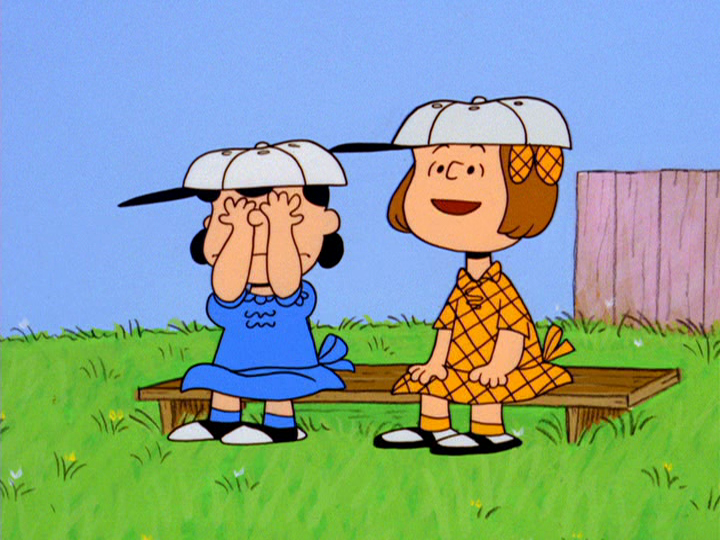 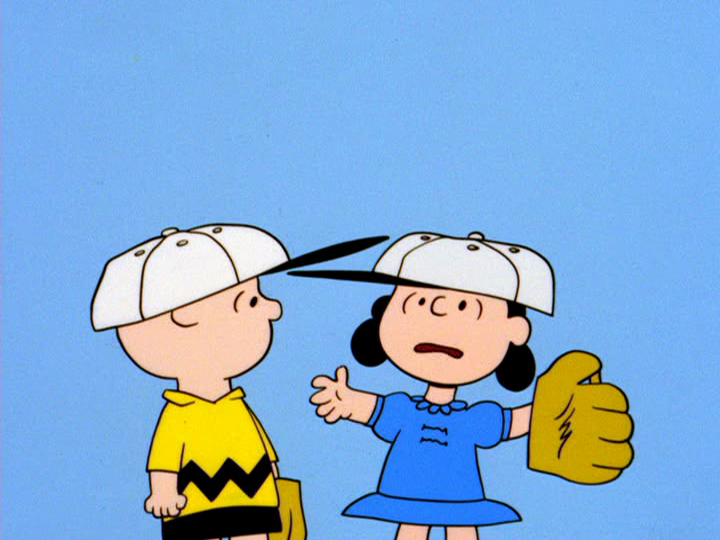 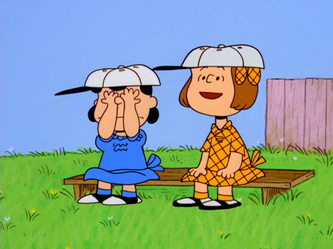 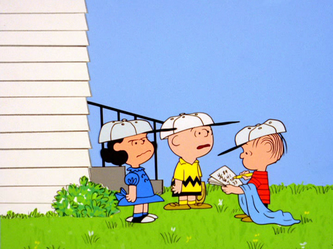 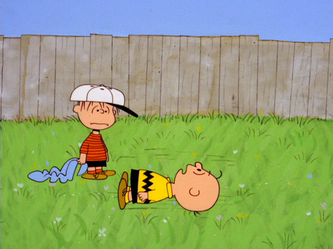 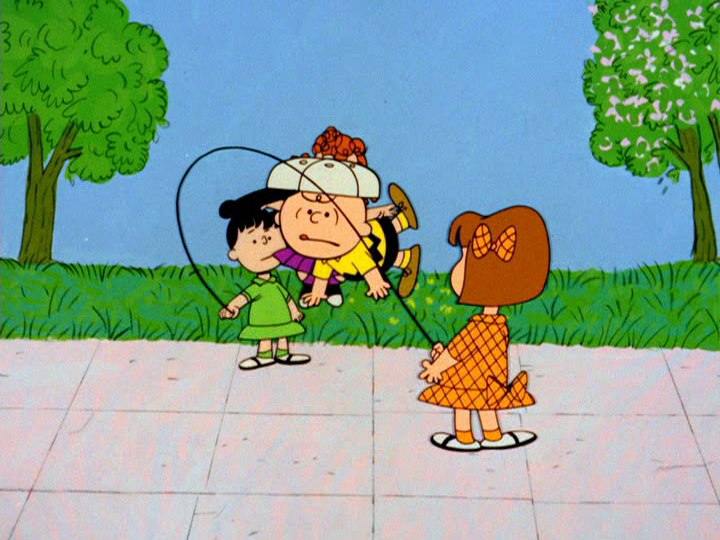 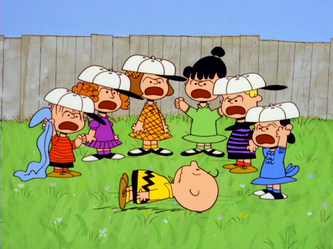 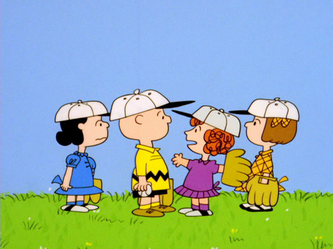 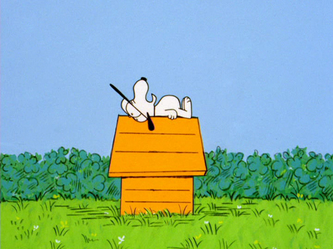 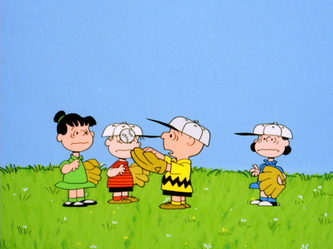 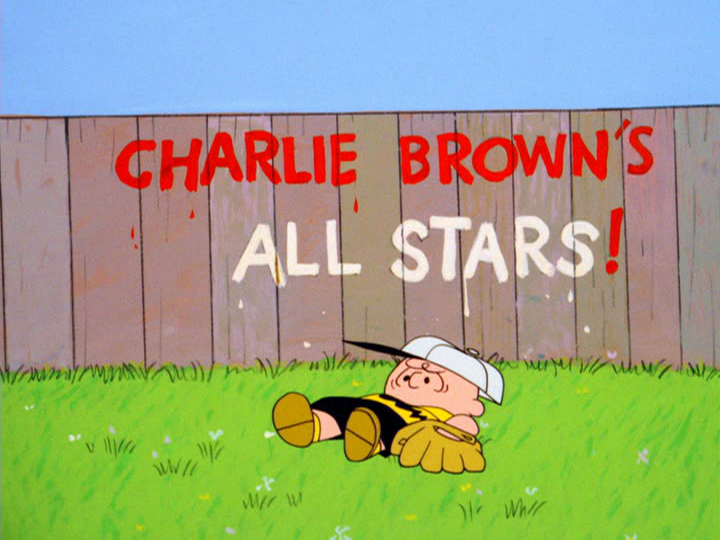 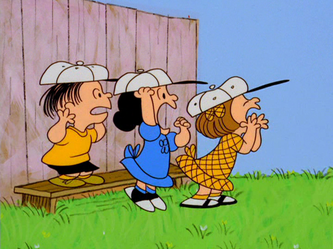 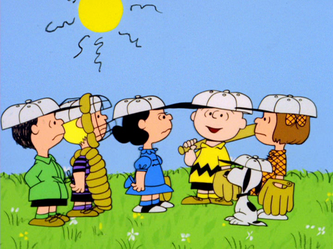 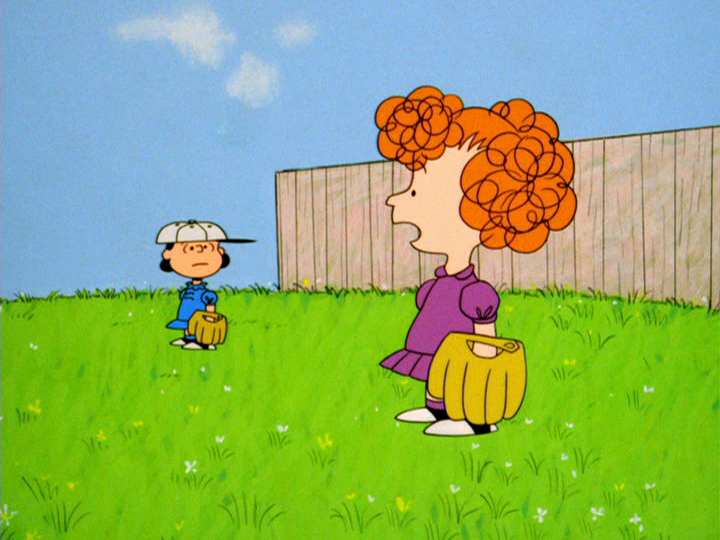 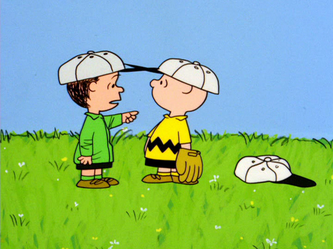 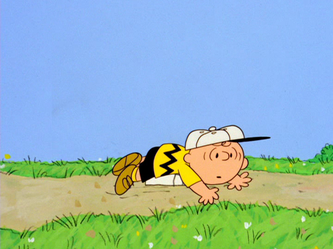 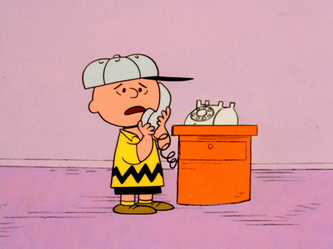 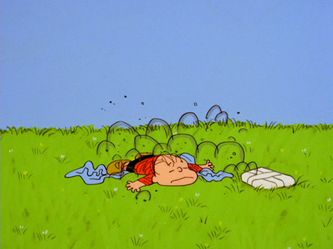 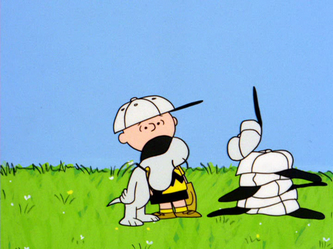 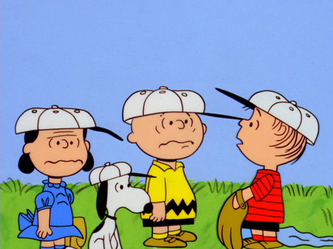 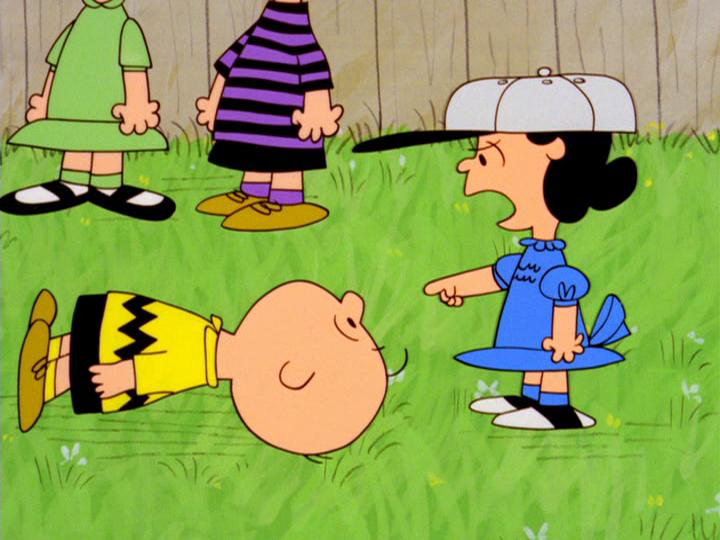 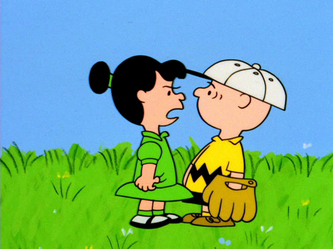 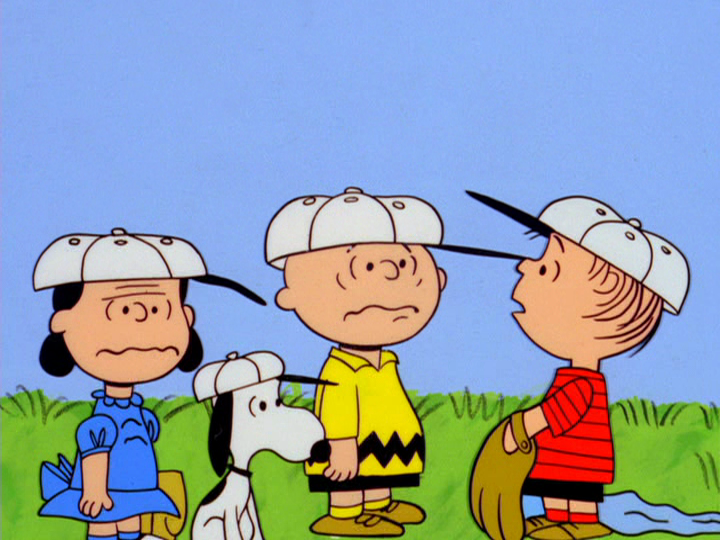 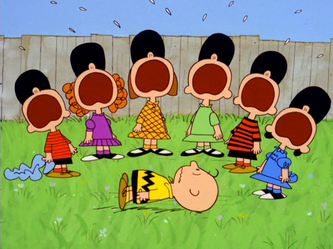 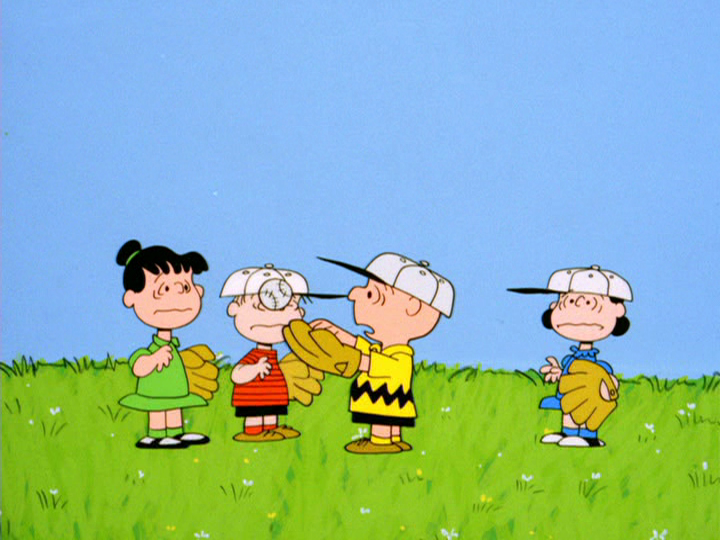 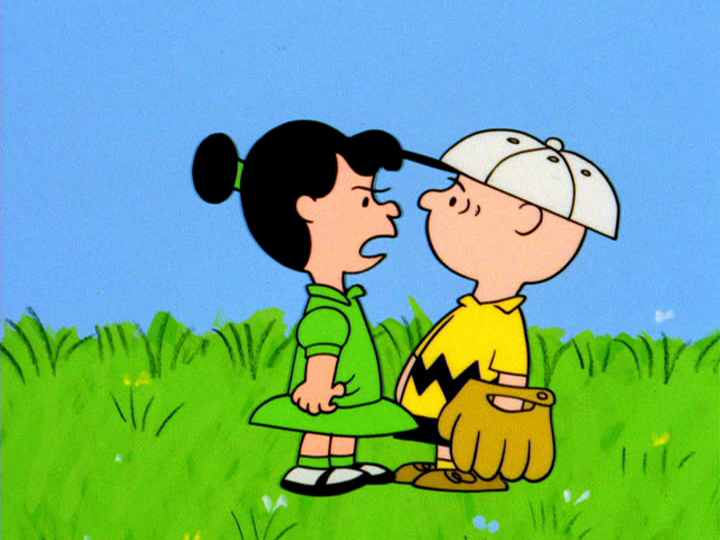 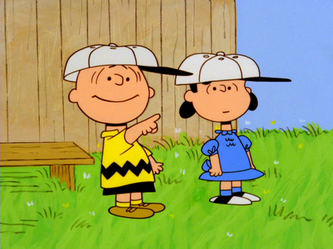 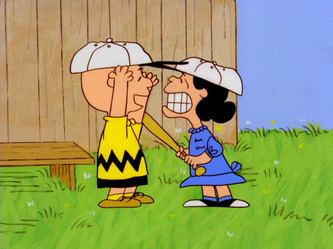 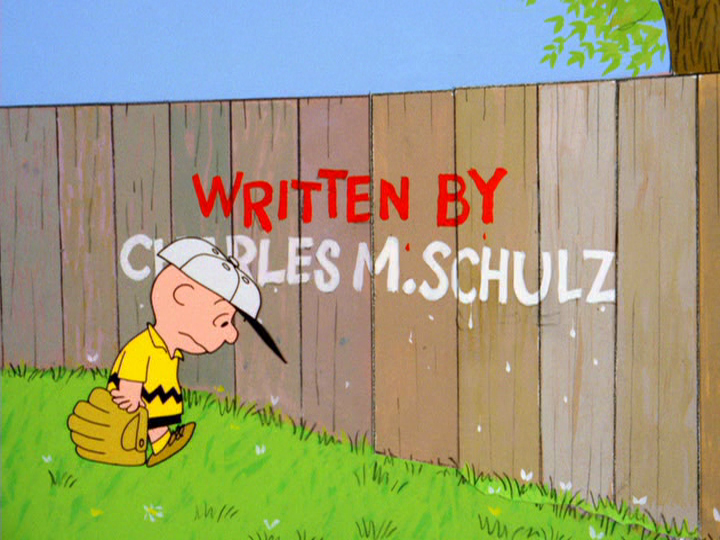 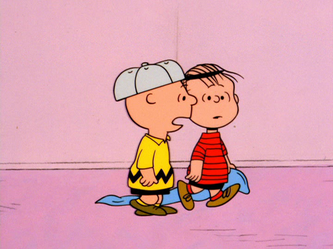 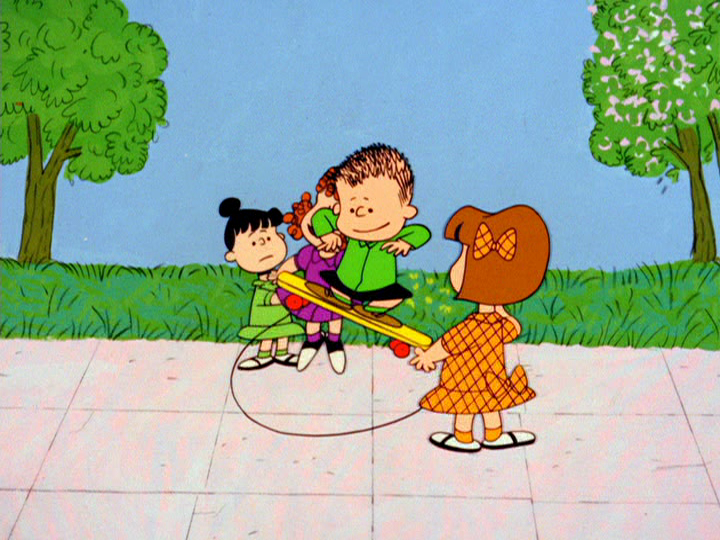 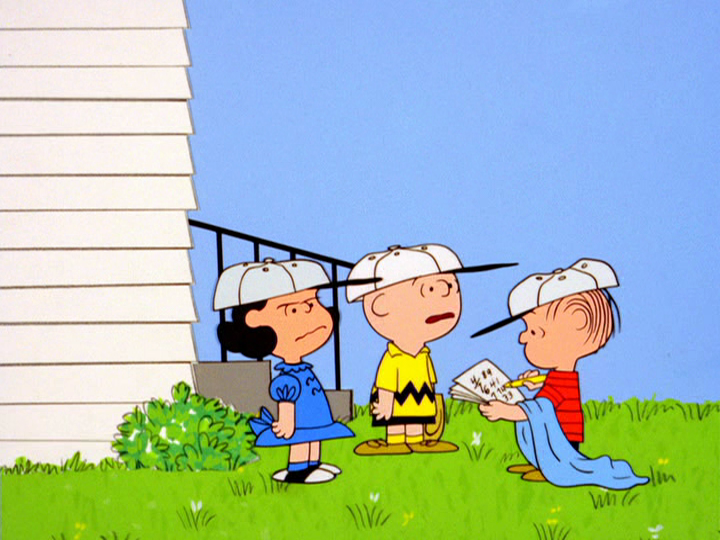 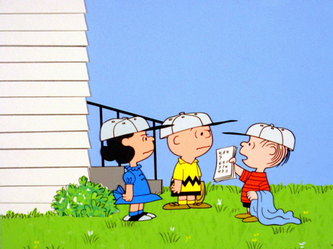 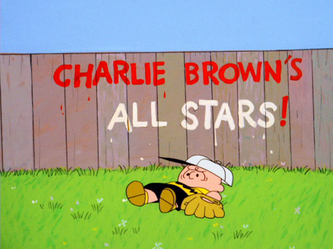 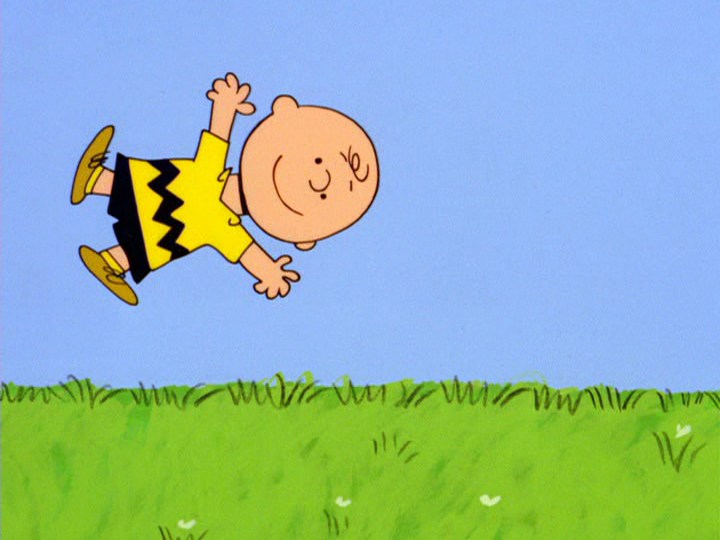 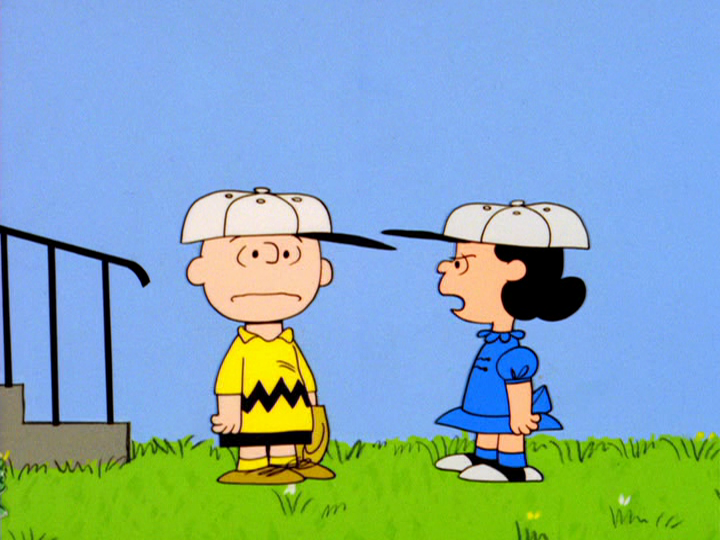 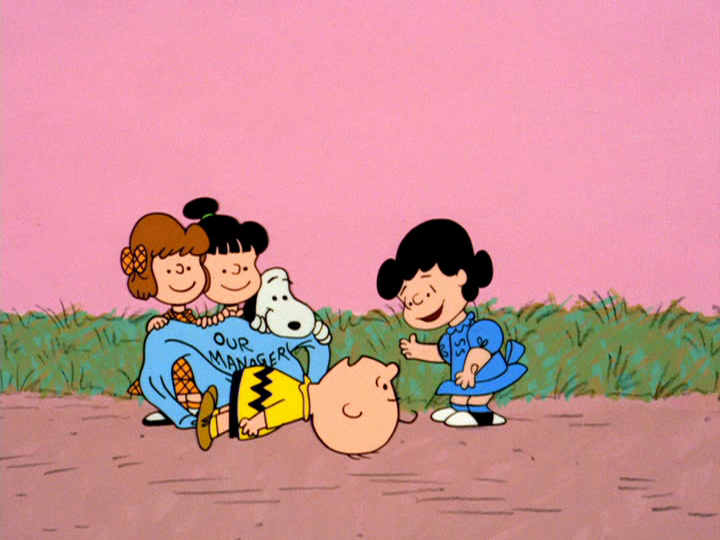 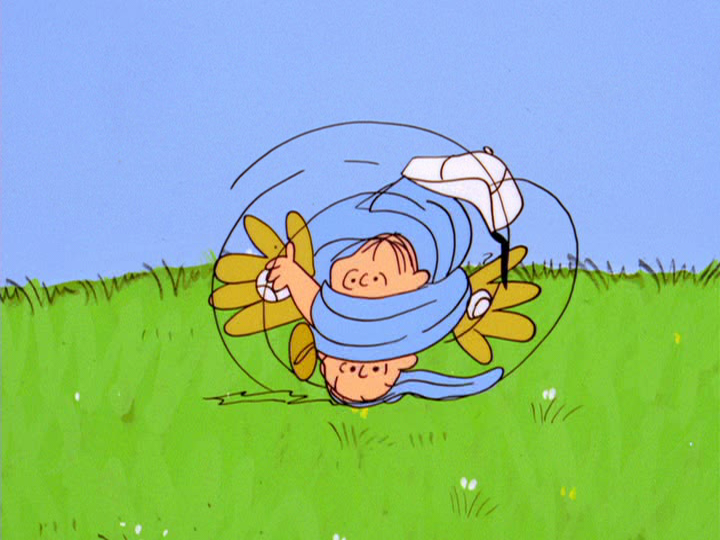 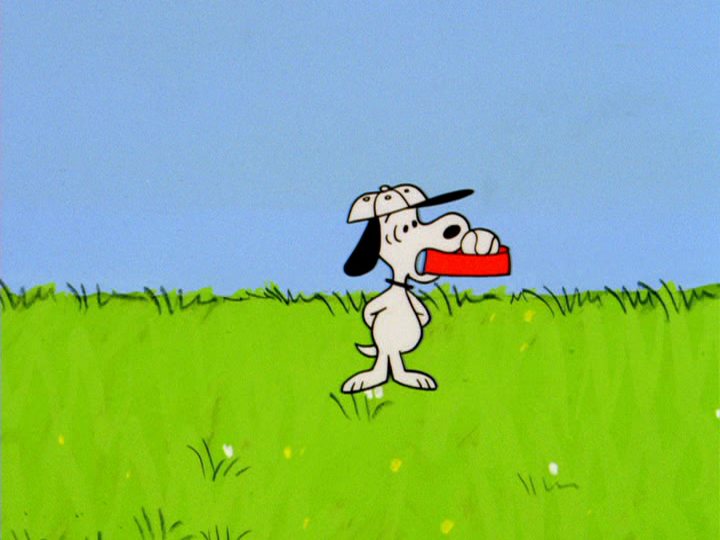 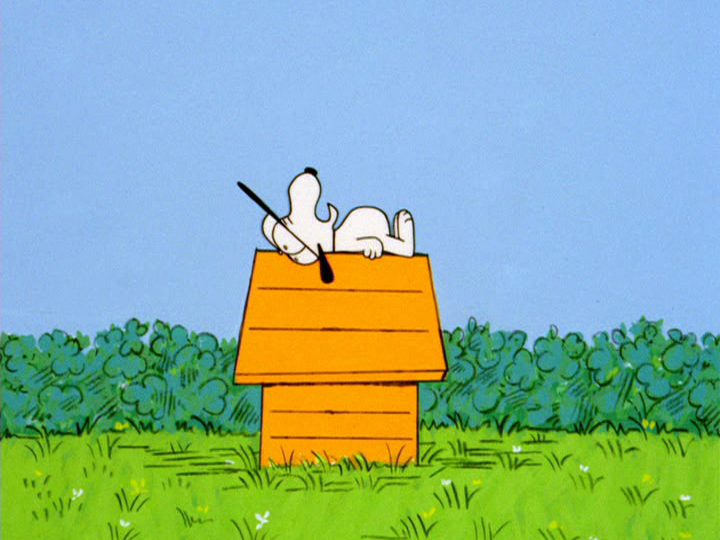 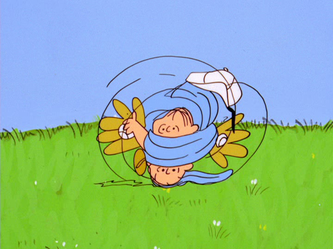 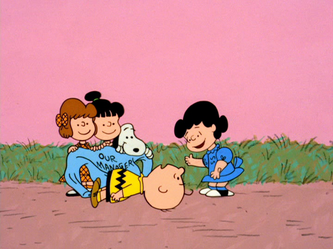 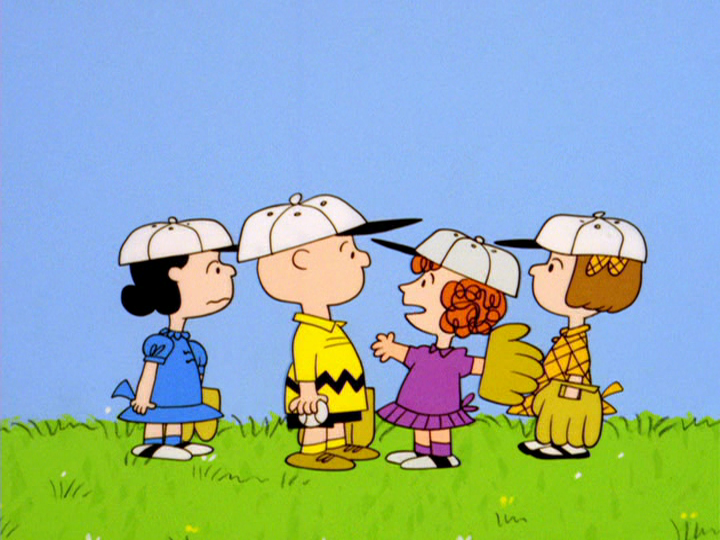 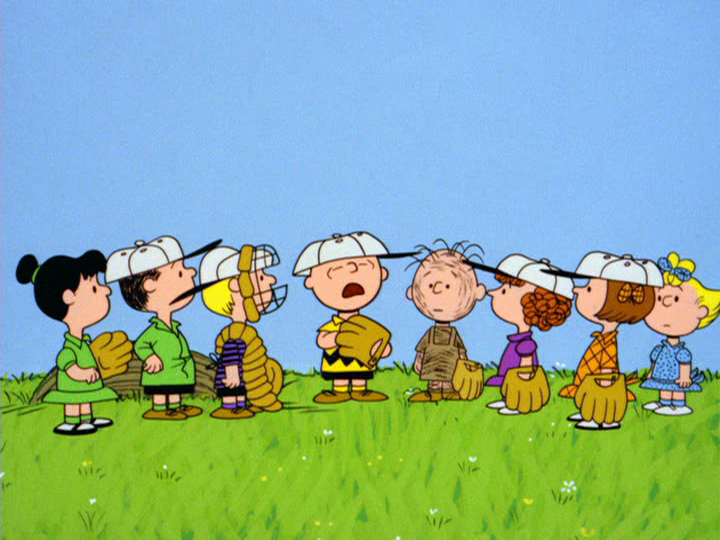 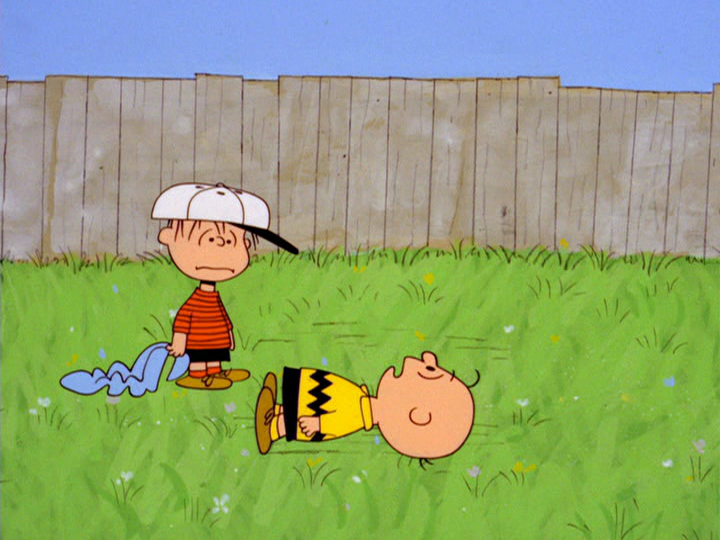 Charlie Brown learns that Mr. Hennessy of Hennessy's Hardware wants to sponsor the team, with one catch: Charlie Brown has to let Snoopy and the girls go. 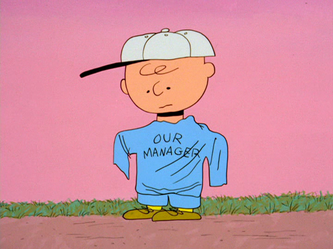 He can't do it, so he keeps the team going, hoping they'll forget about the uniforms. 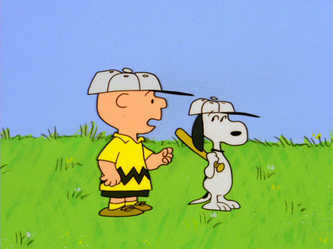 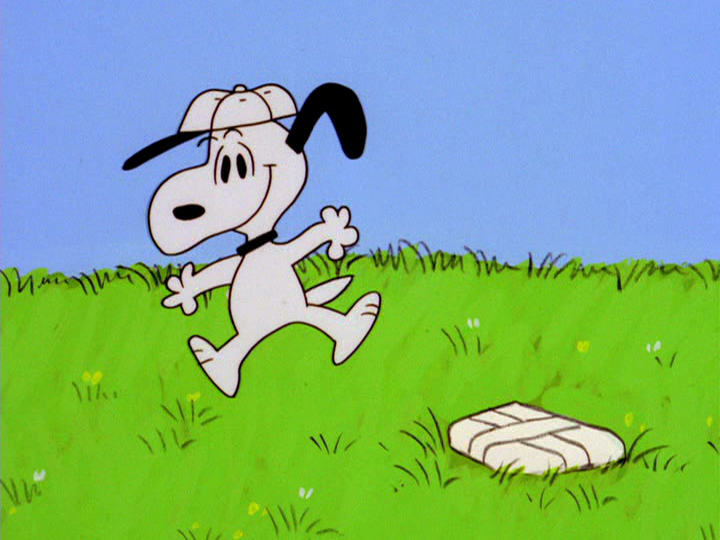 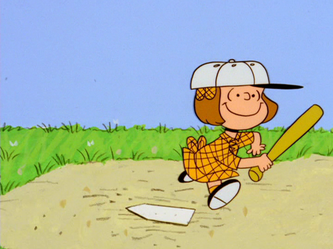 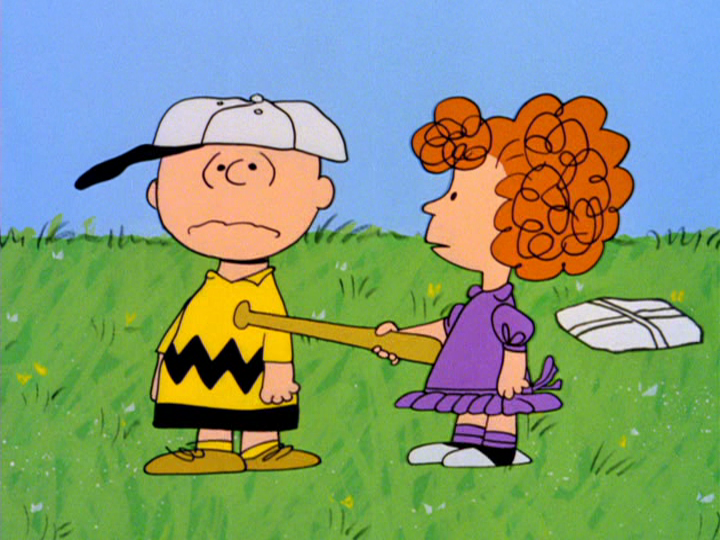 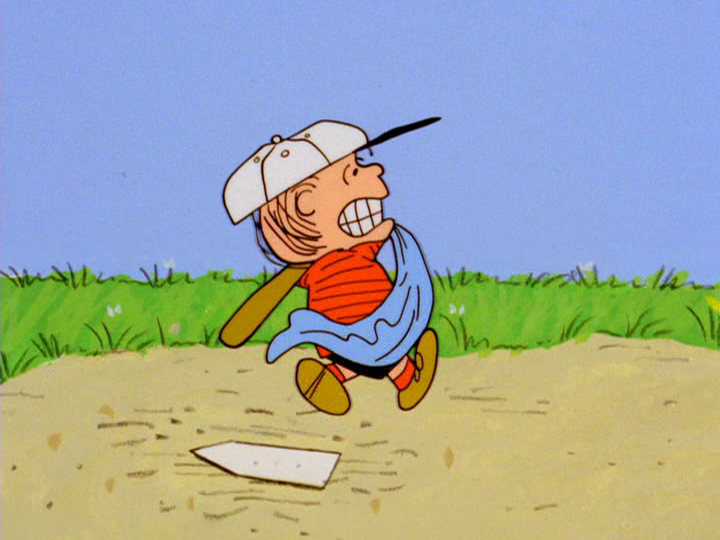 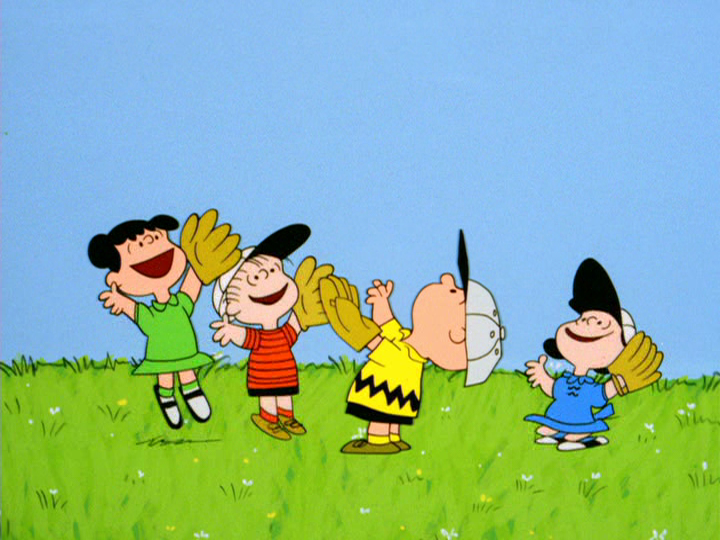 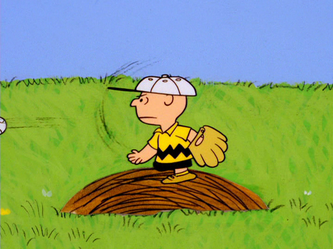 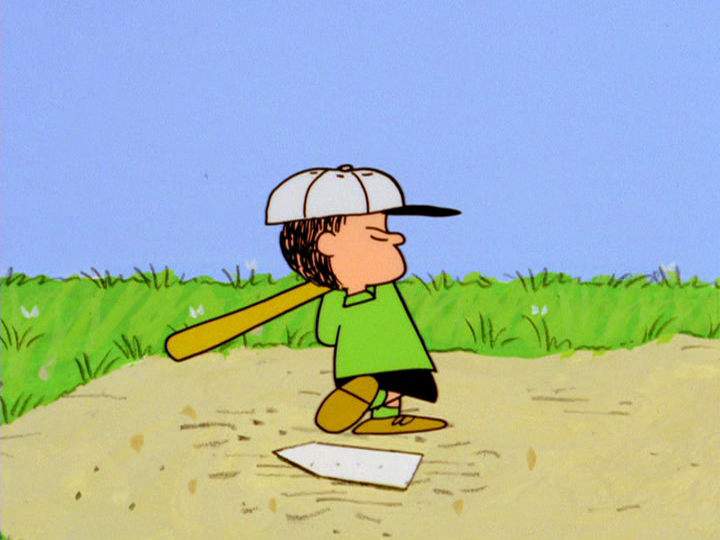 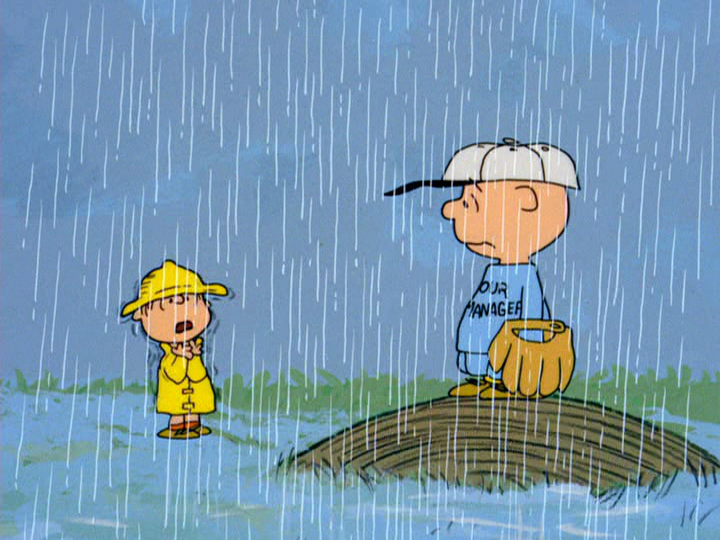 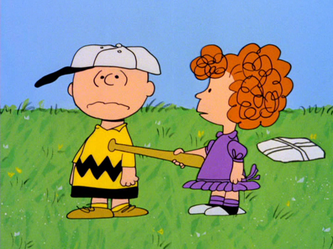 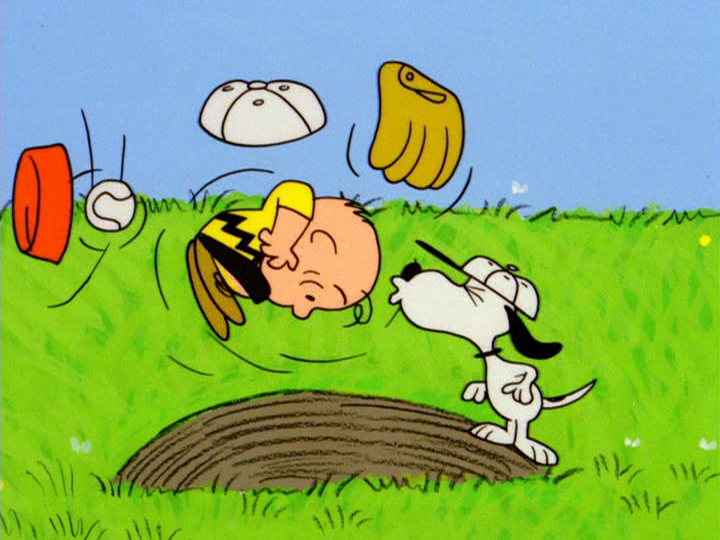 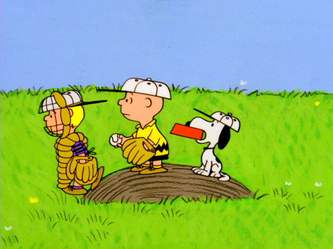 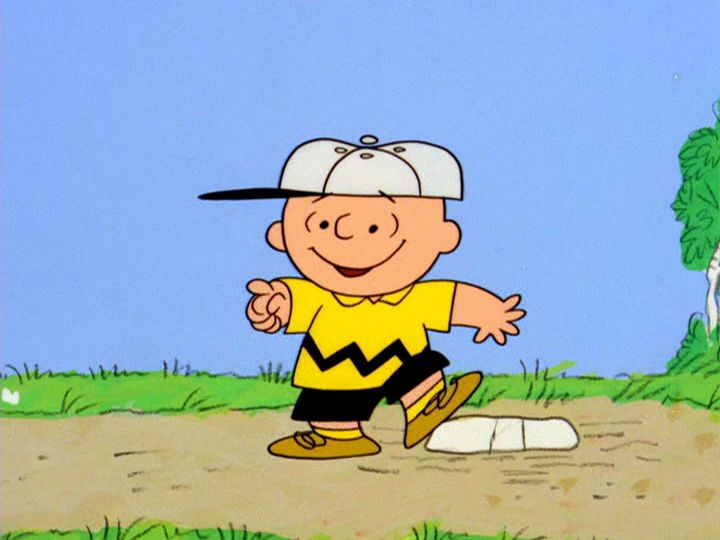 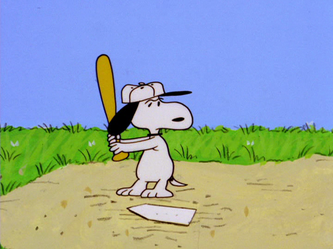 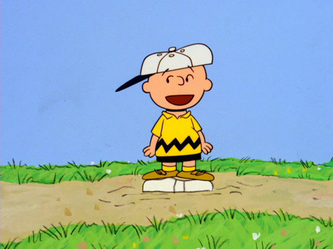 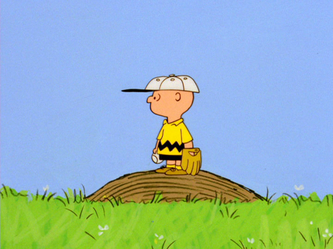 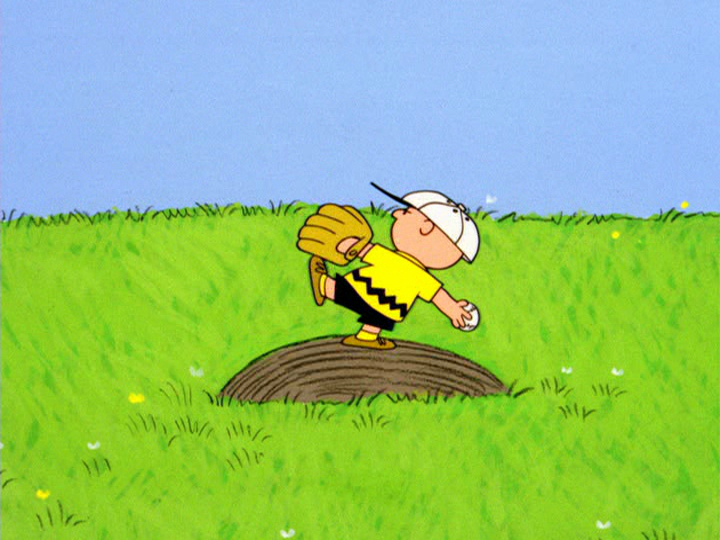 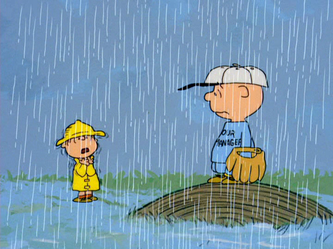 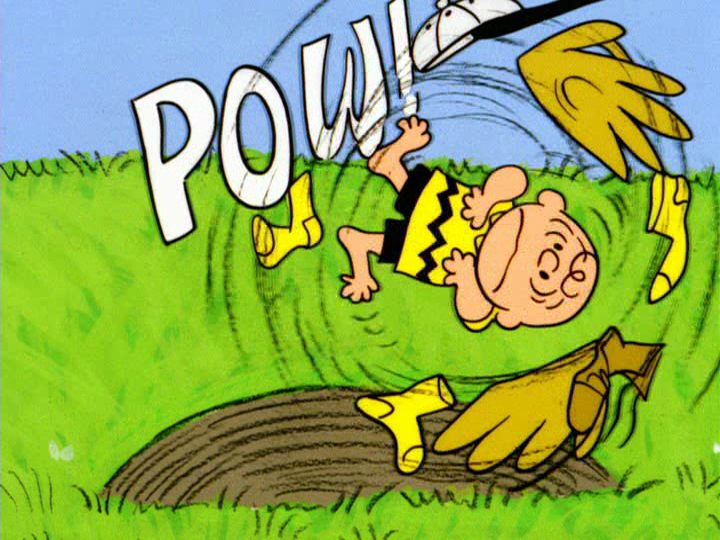 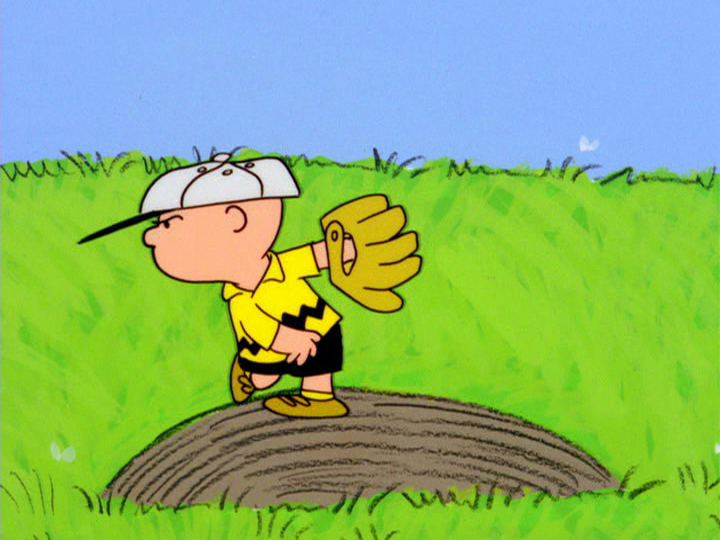 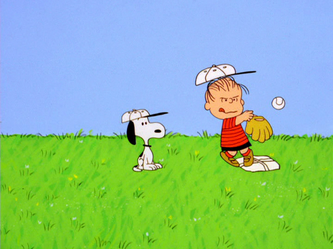 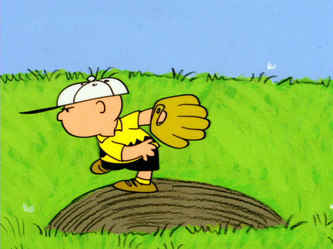 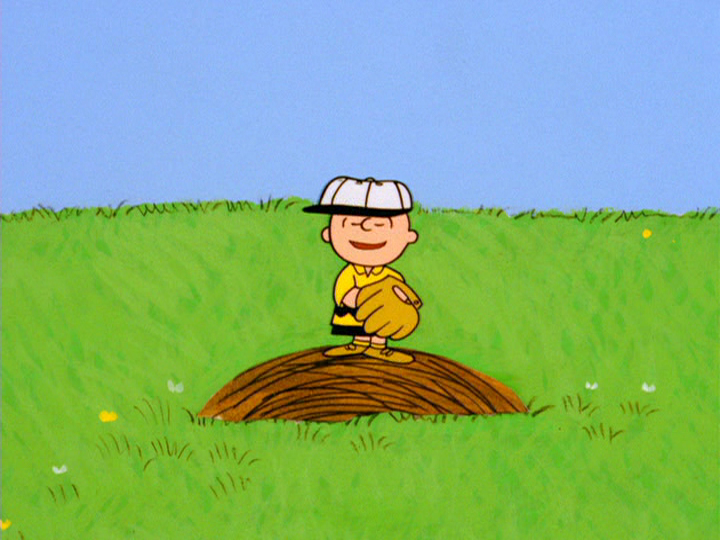 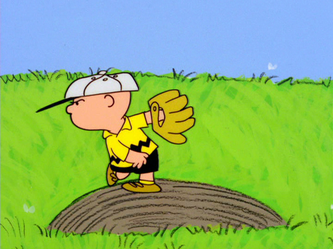 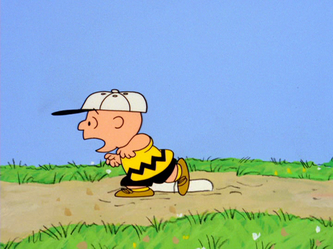 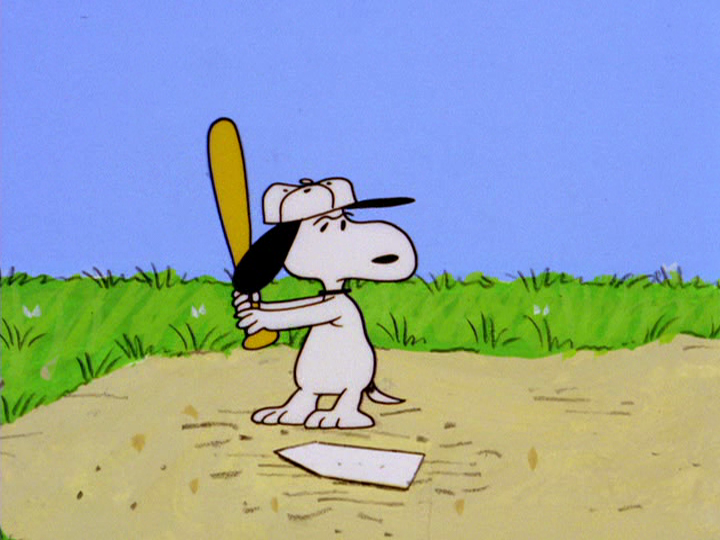 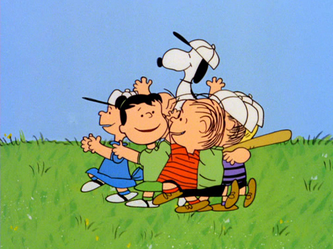 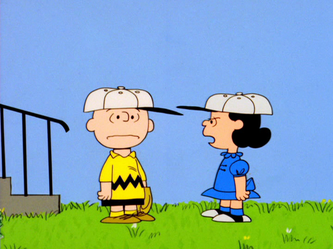 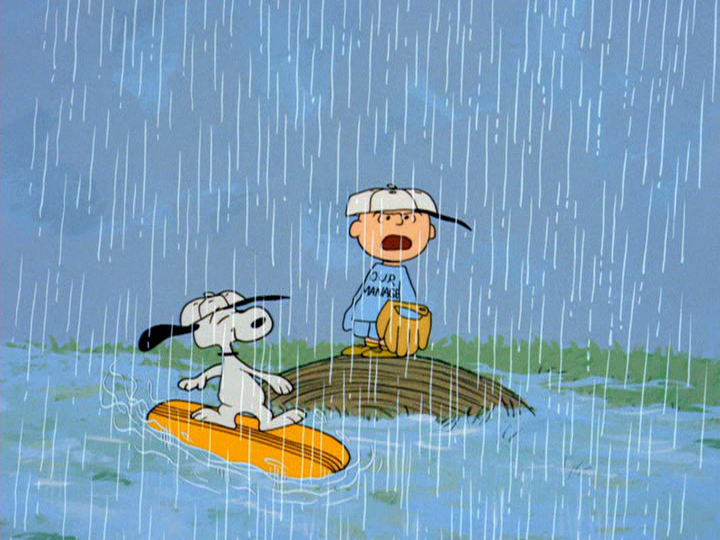 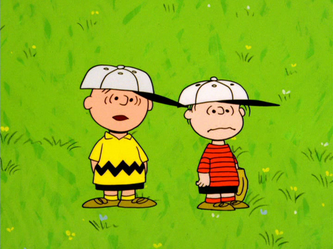 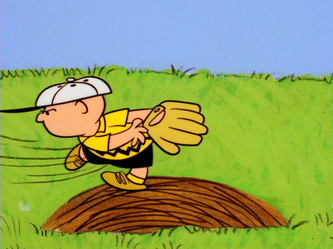 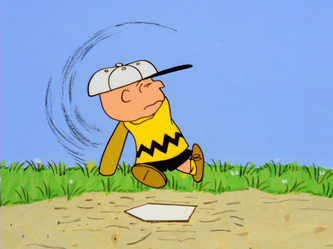 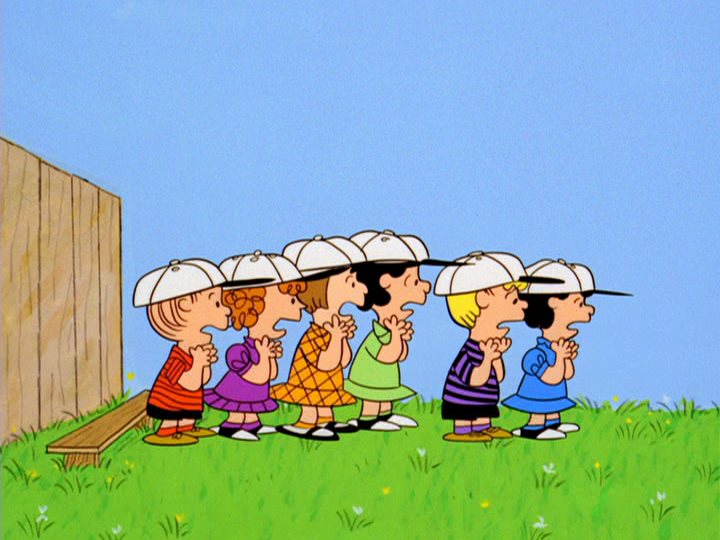 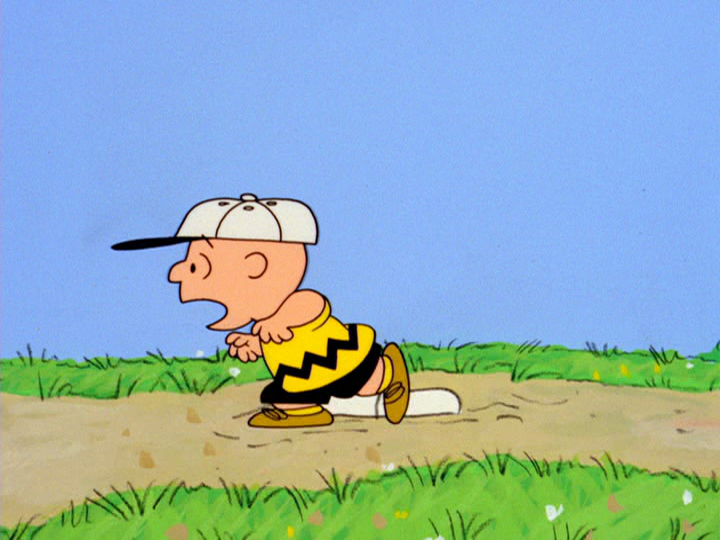 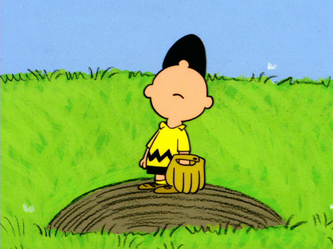 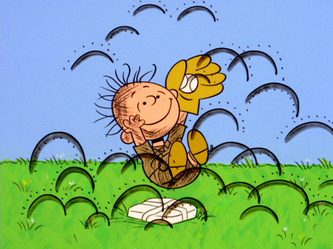 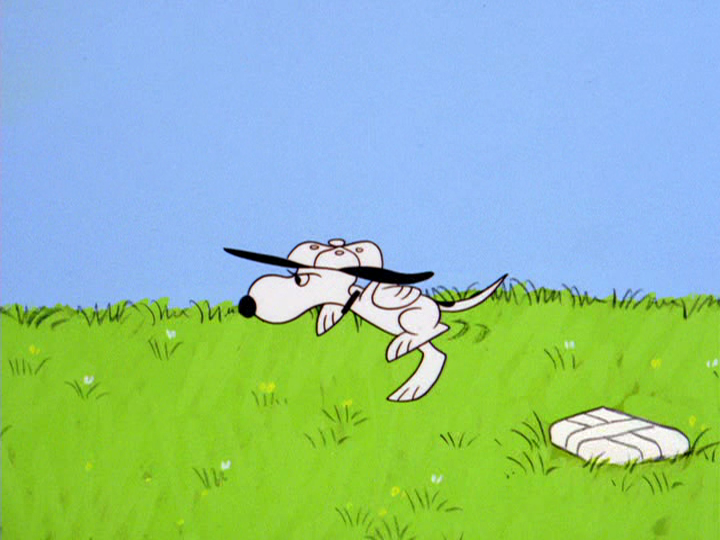 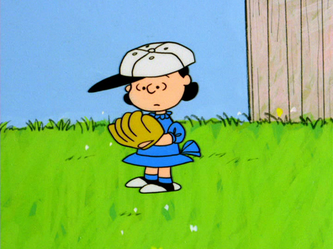 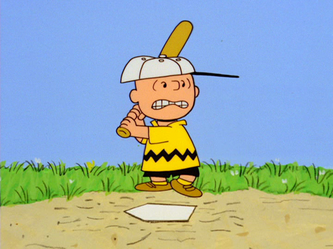 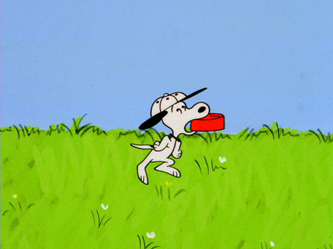 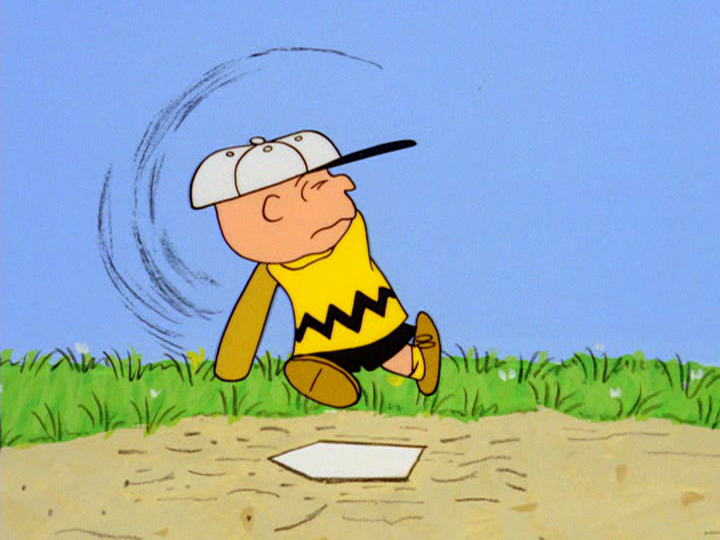 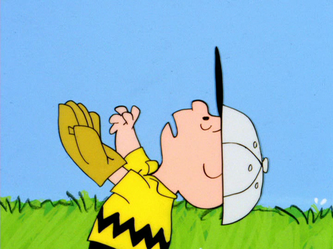 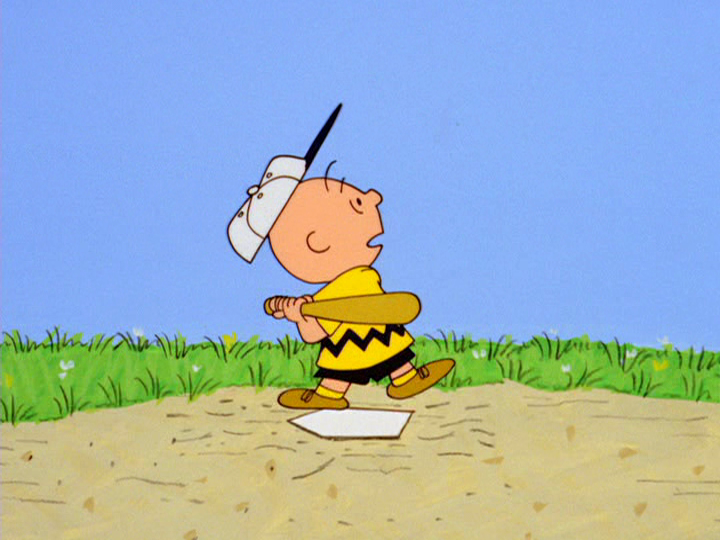 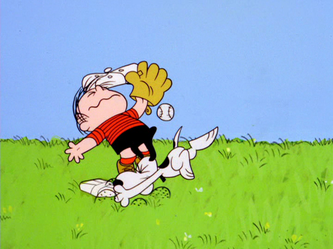 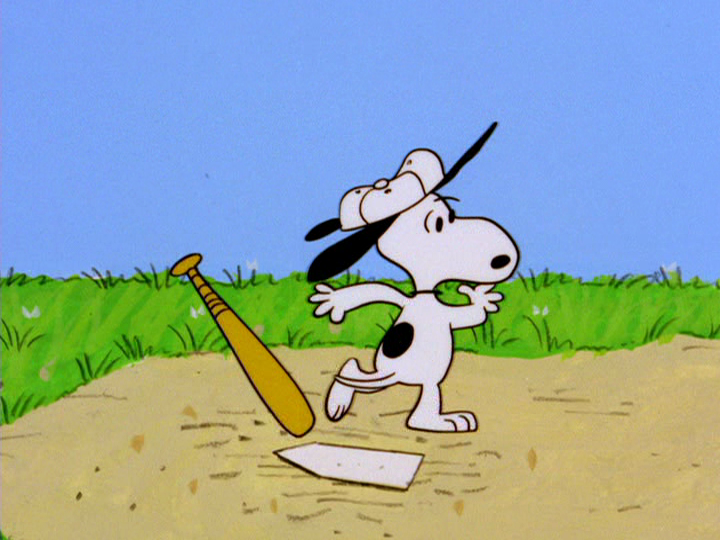 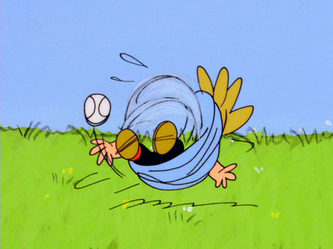 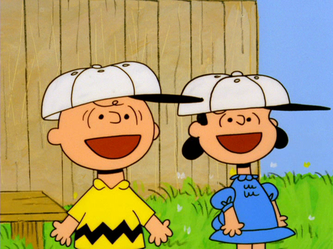 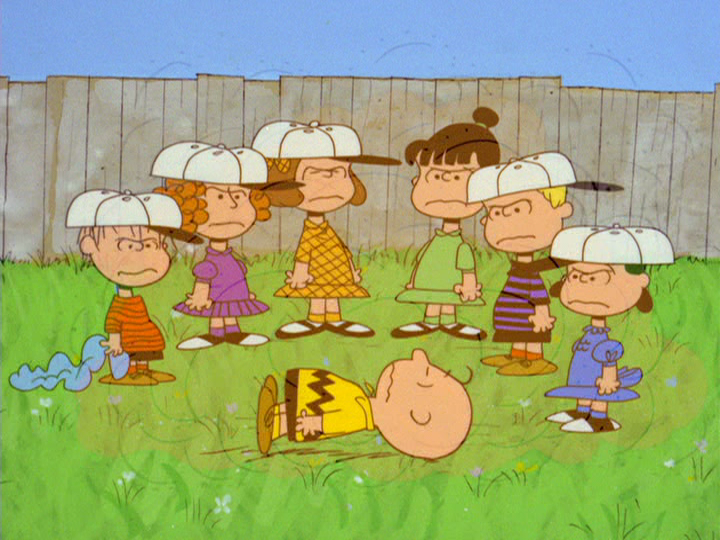 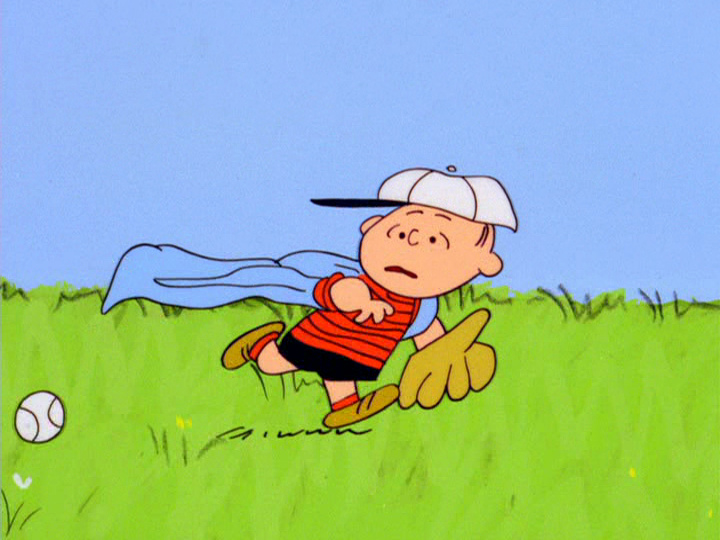 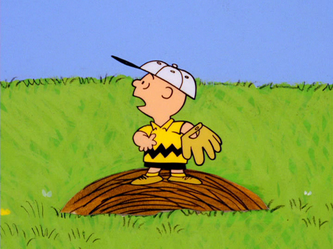 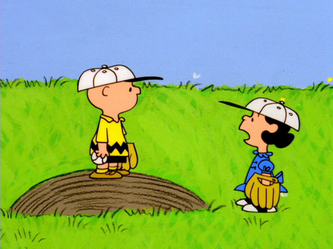 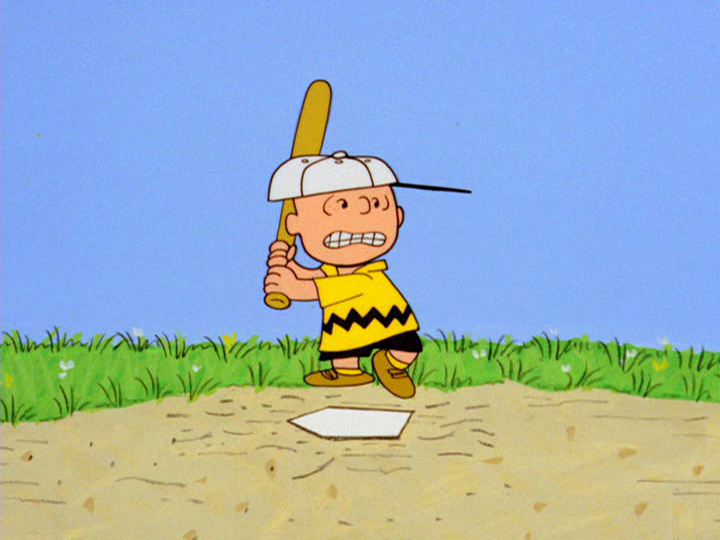 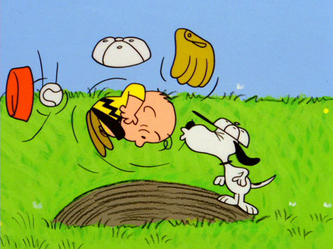 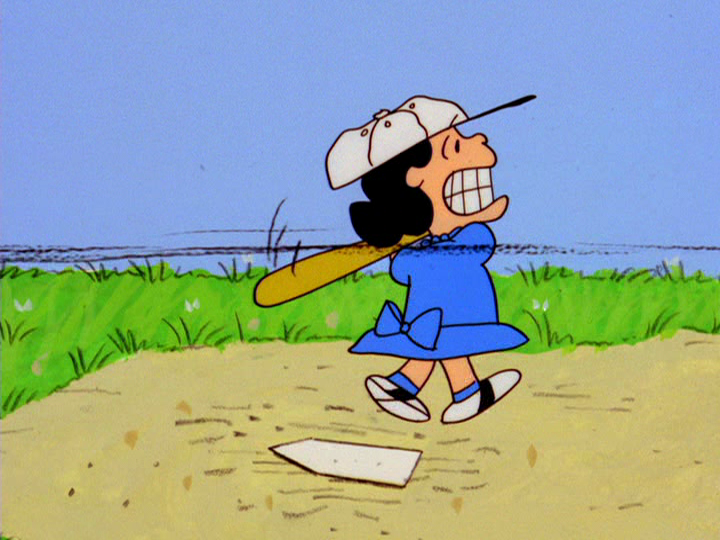 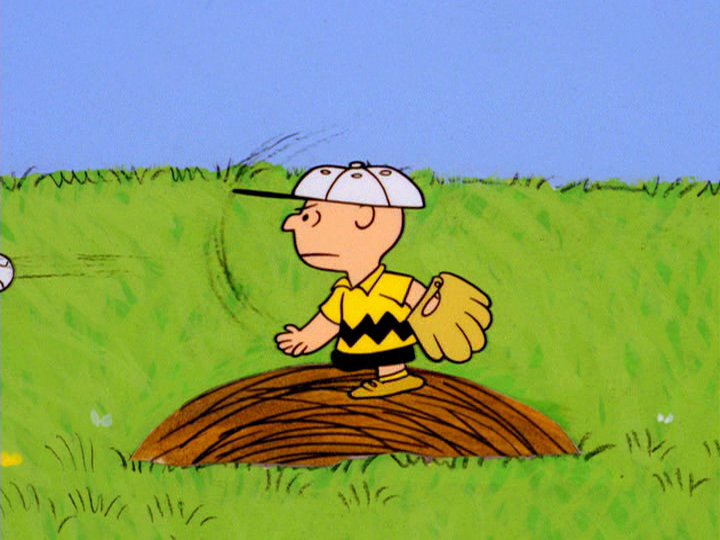 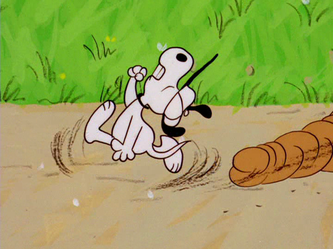 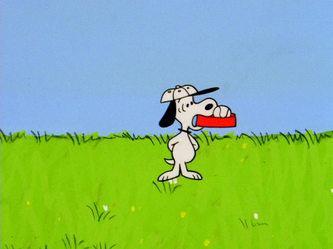 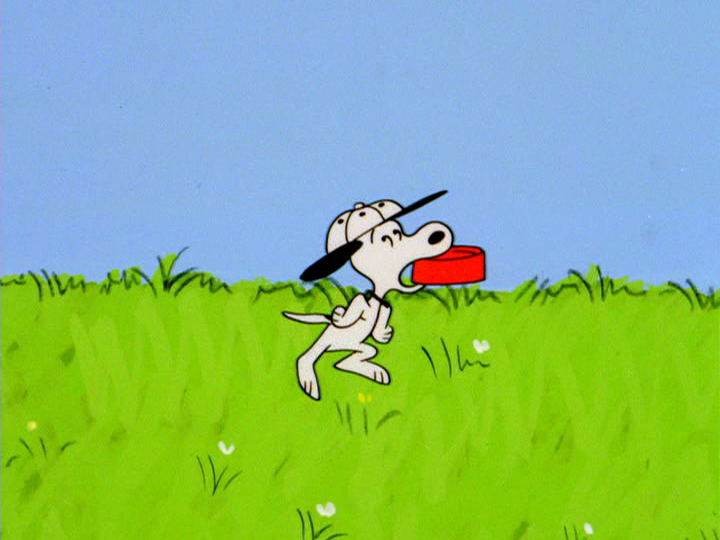 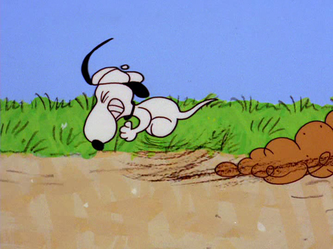 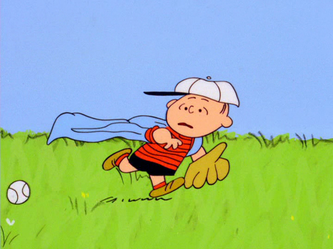 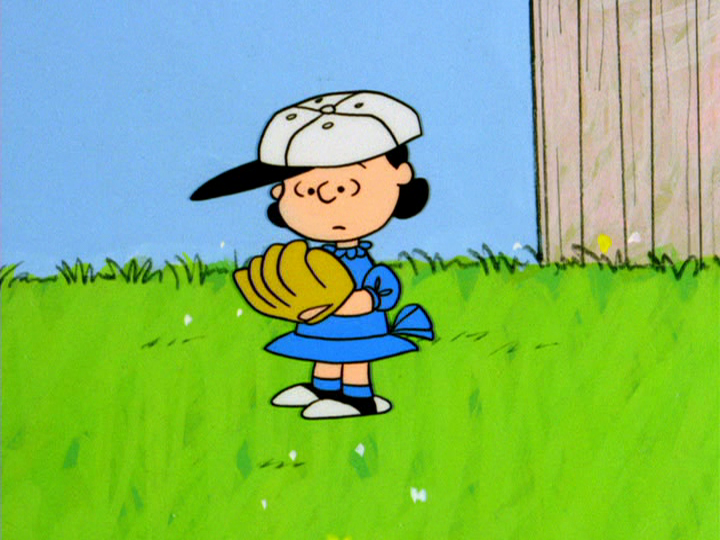 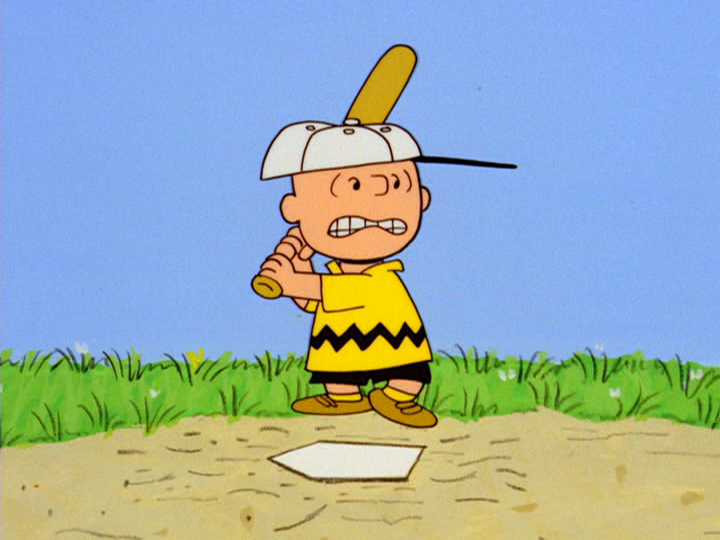 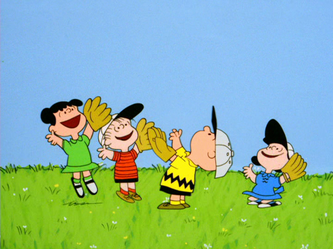 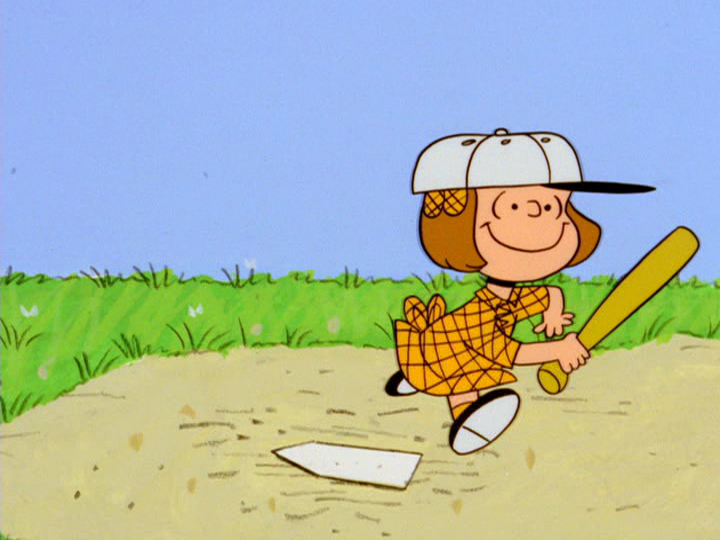 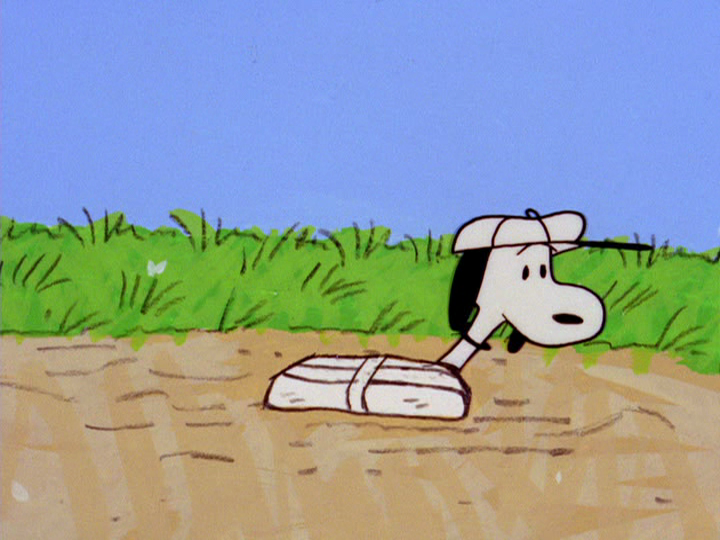 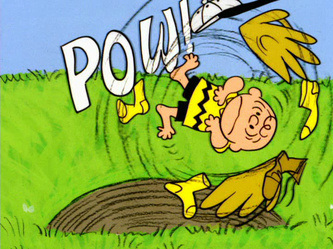 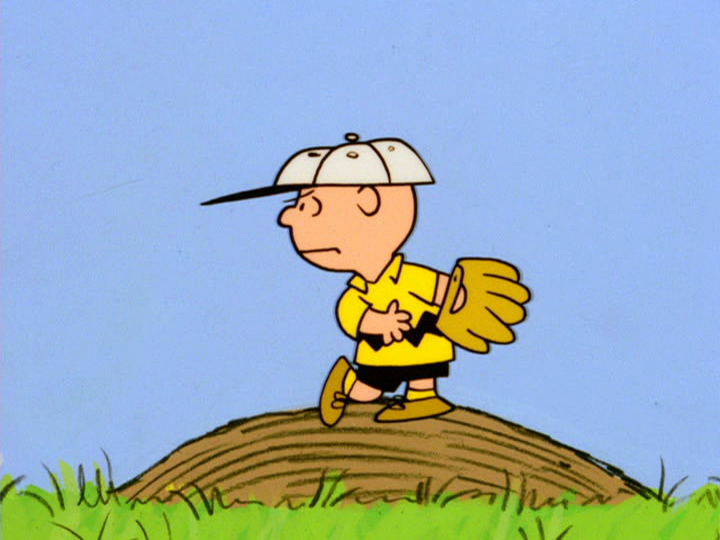 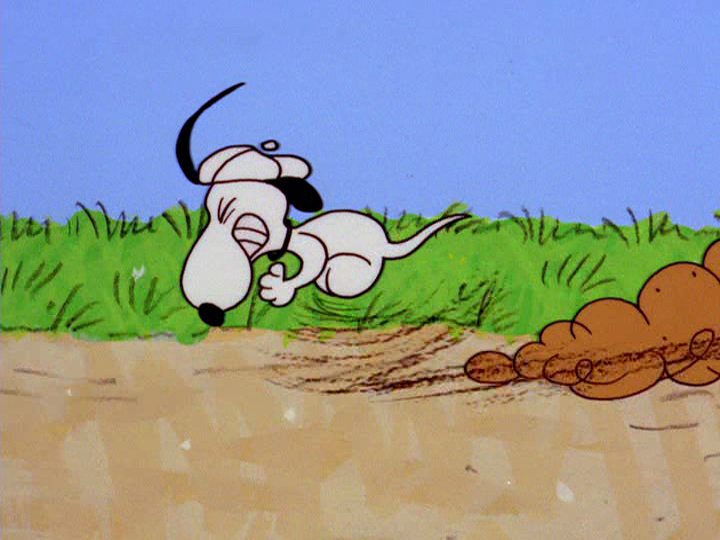 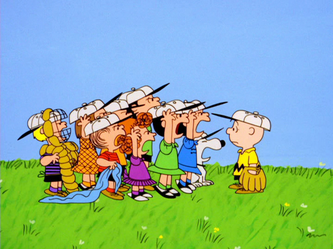 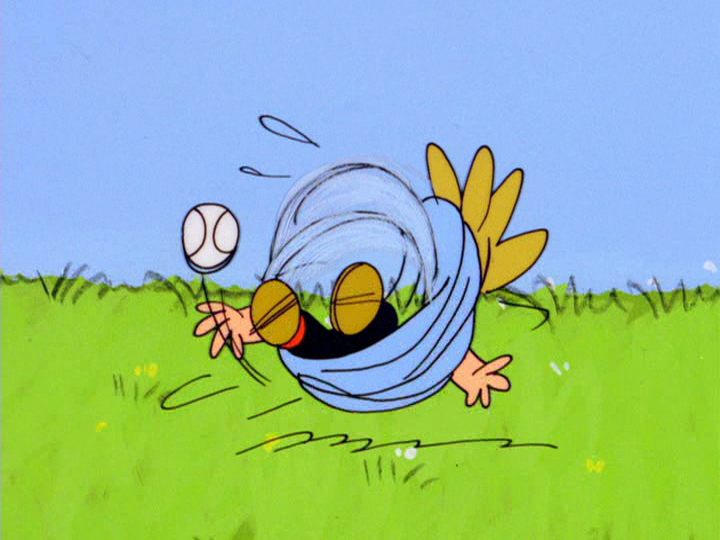 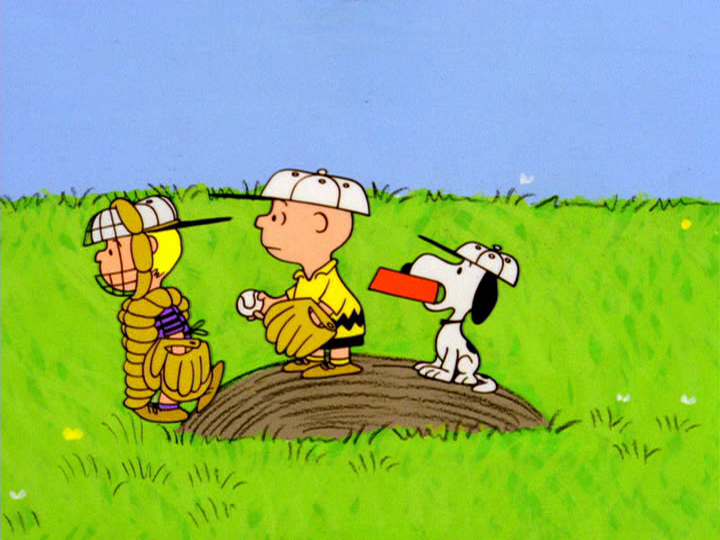 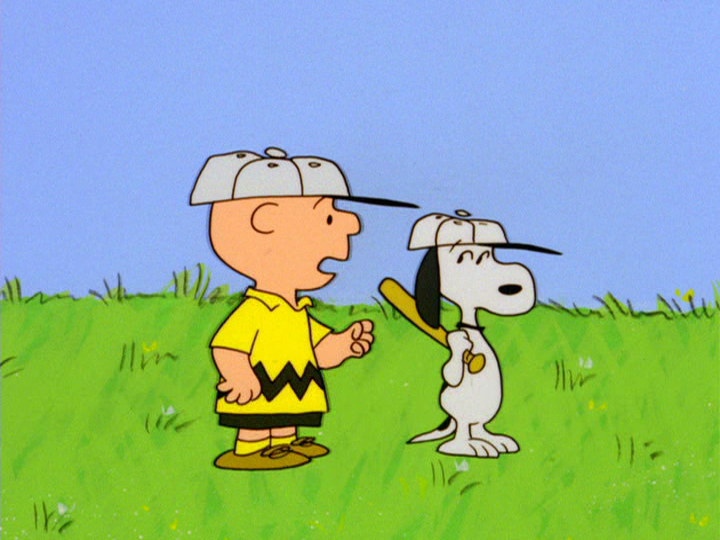 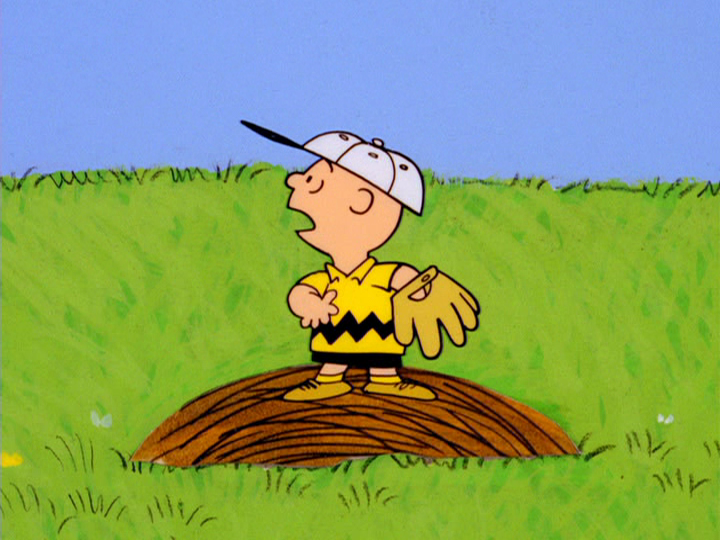 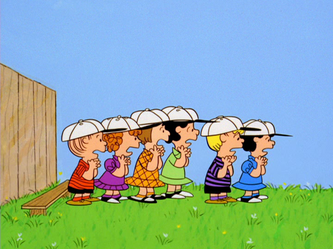 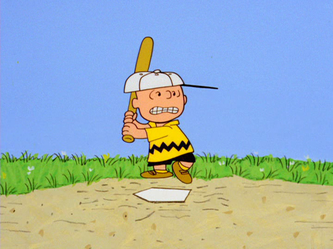 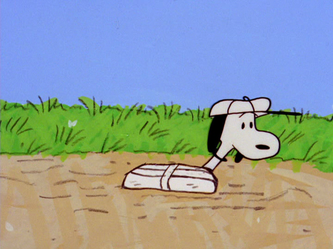 They almost win a game, only to have Charlie Brown mess it up by trying to be the hero and steal home plate like Snoopy had done. 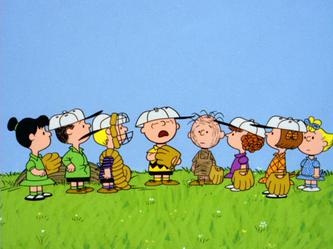 After that, he tells the team that there's no uniforms. 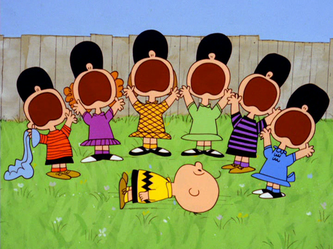 They go away angry. 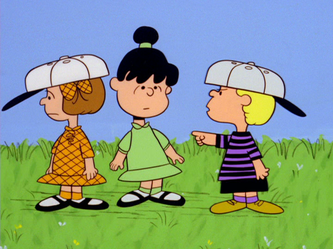 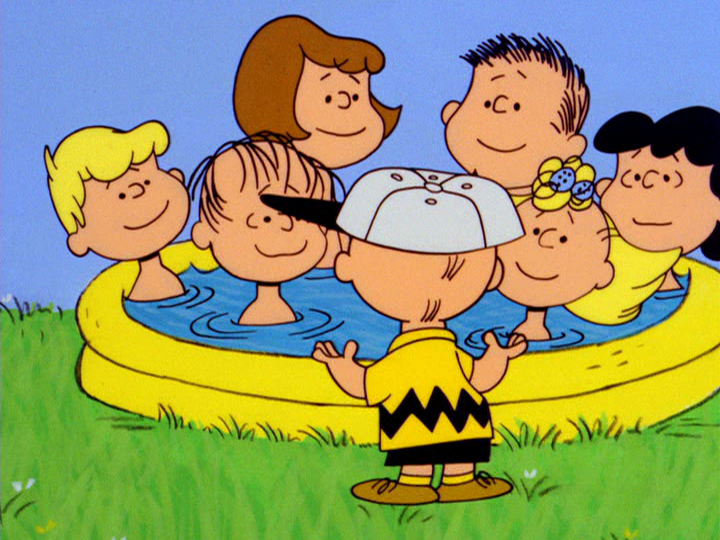 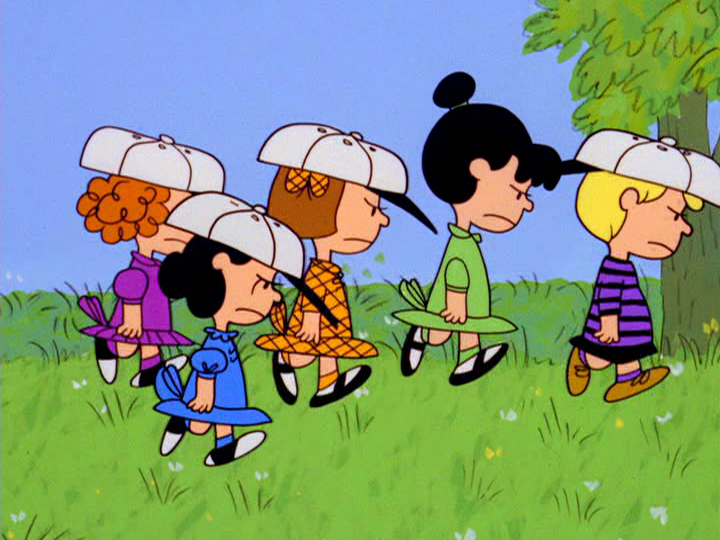 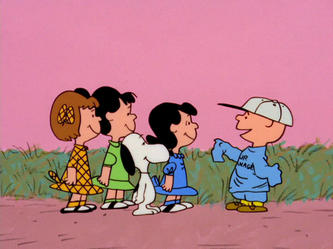 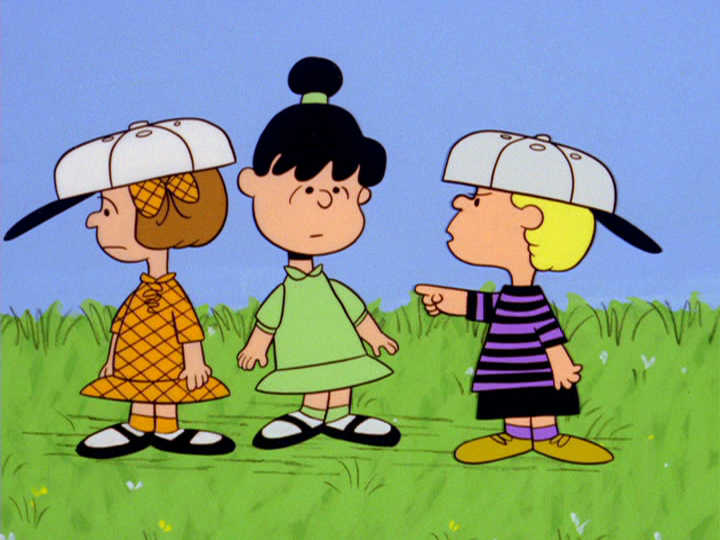 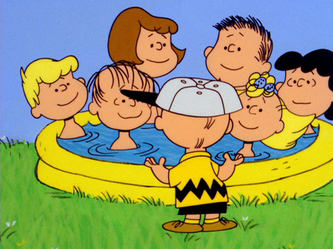 Linus explains to them why there's no uniforms, which makes everyone feel bad. 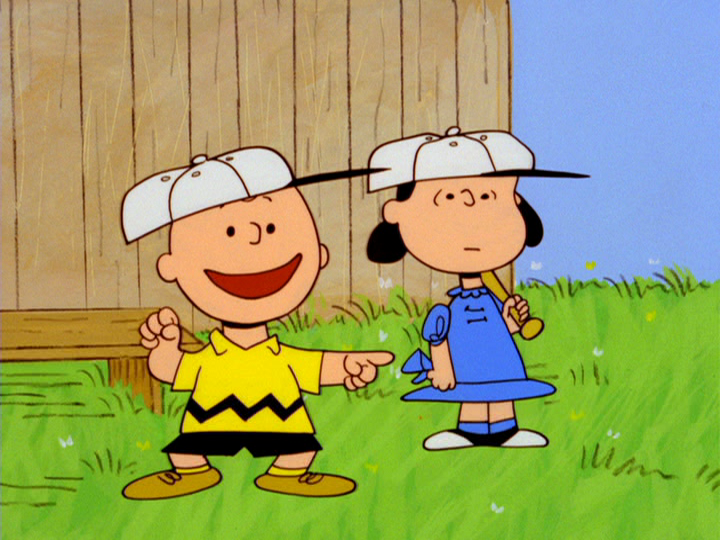 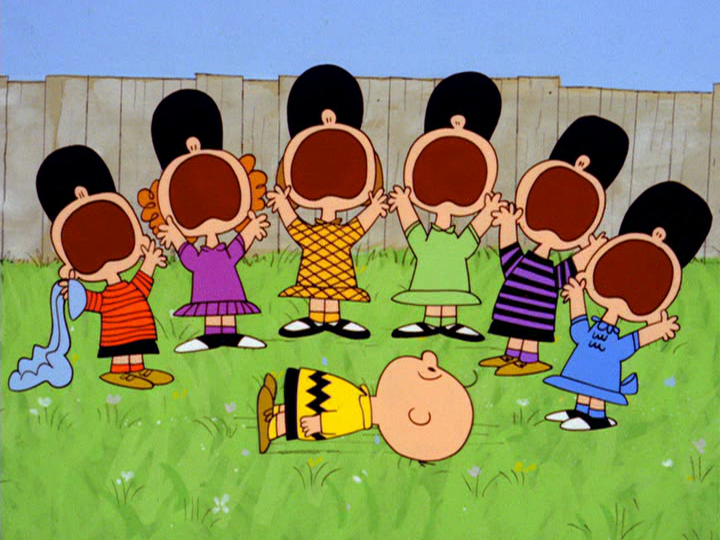 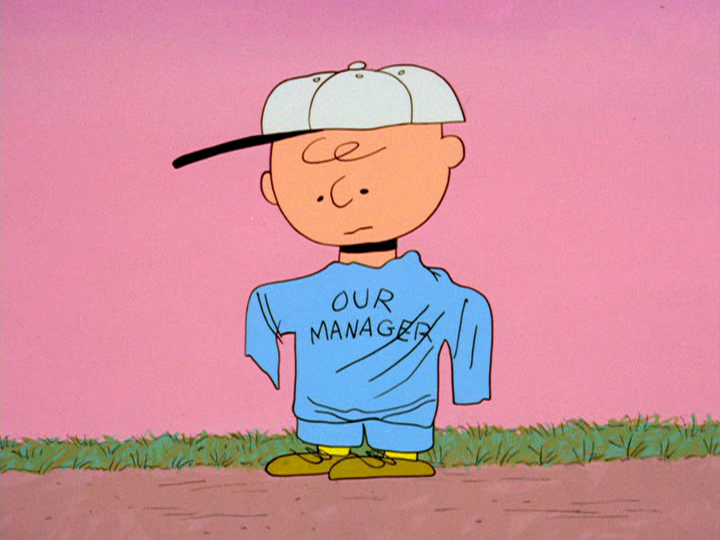 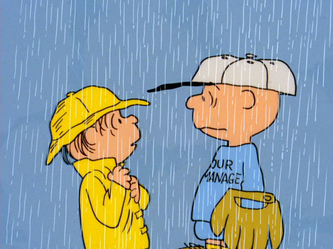 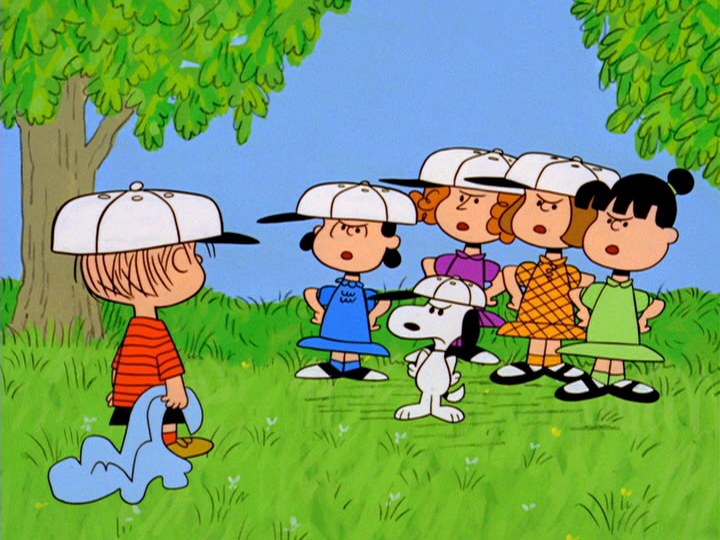 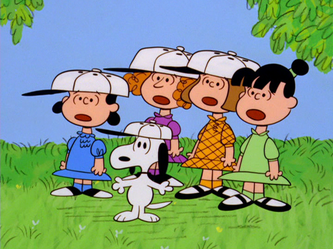 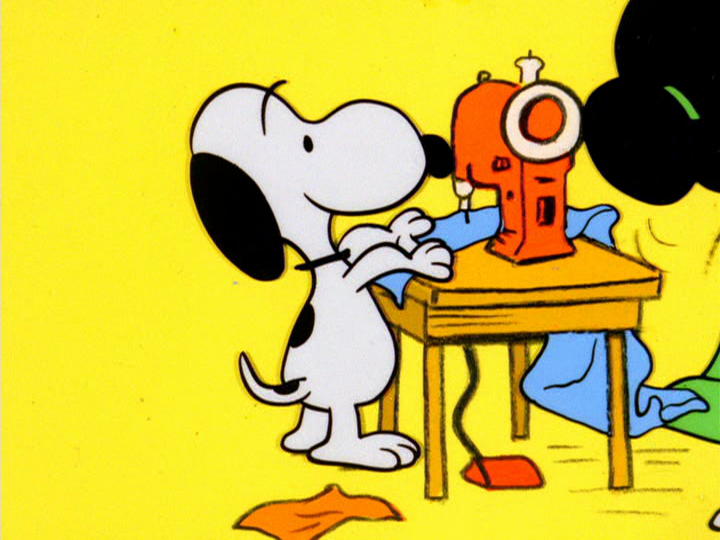 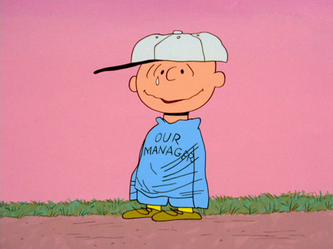 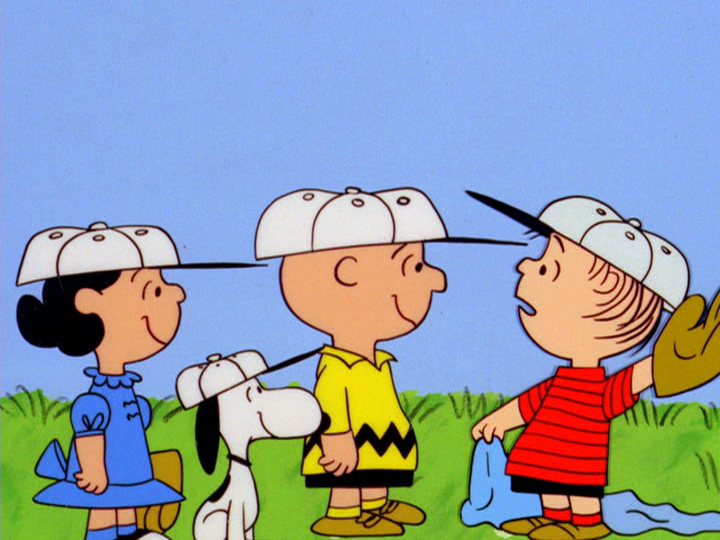 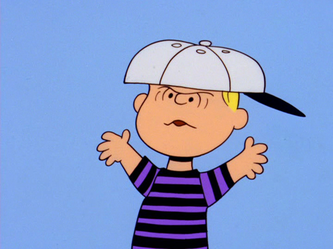 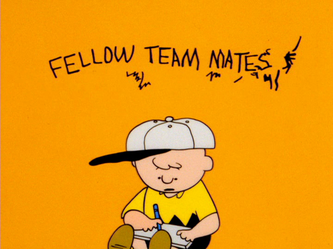 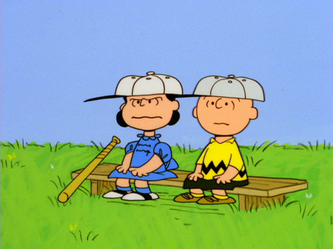 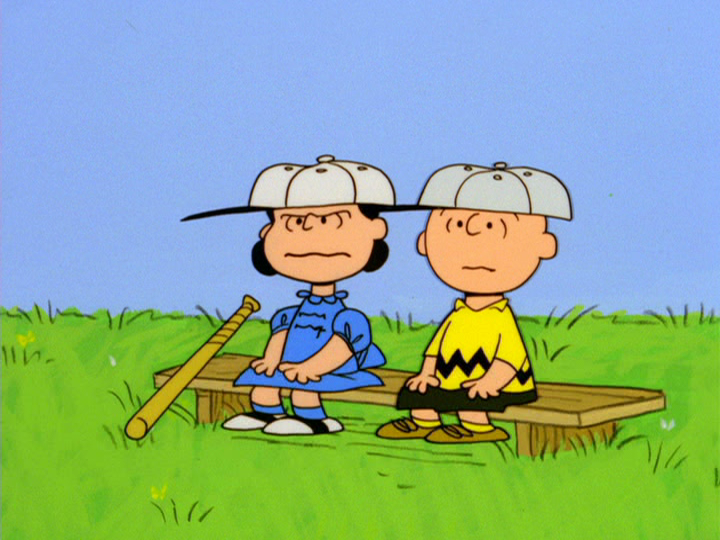 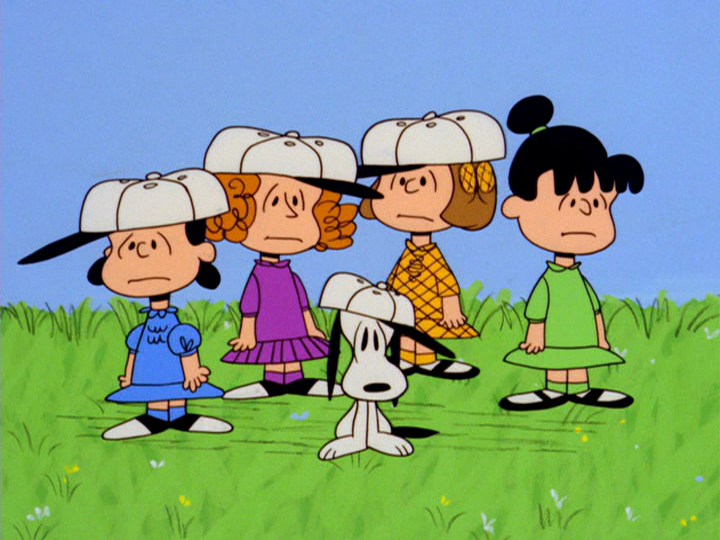 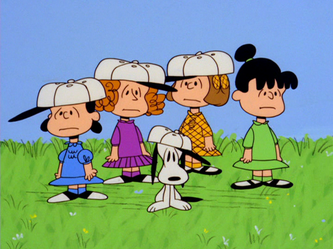 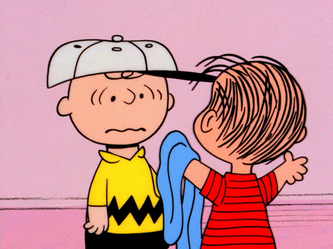 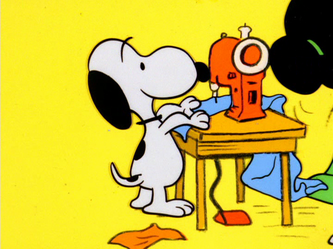 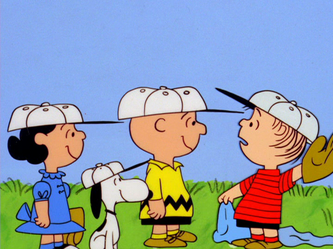 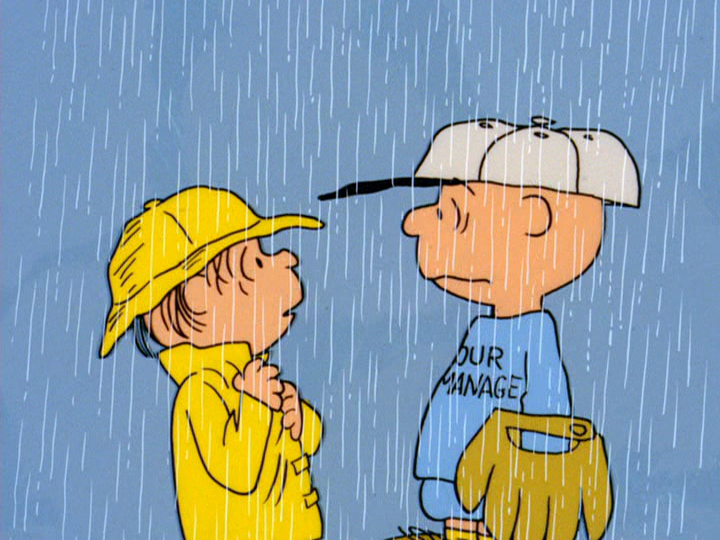 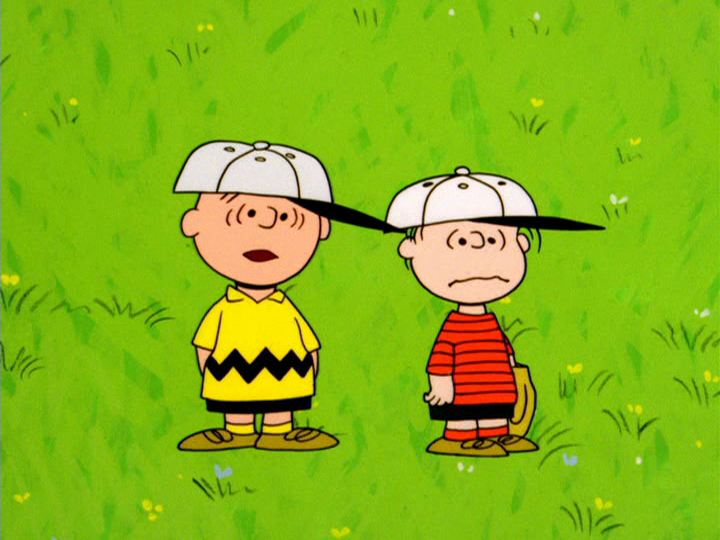 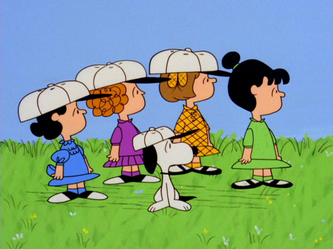 They decide to make Charlie Brown a manager's uniform--out of Linus' blanket! 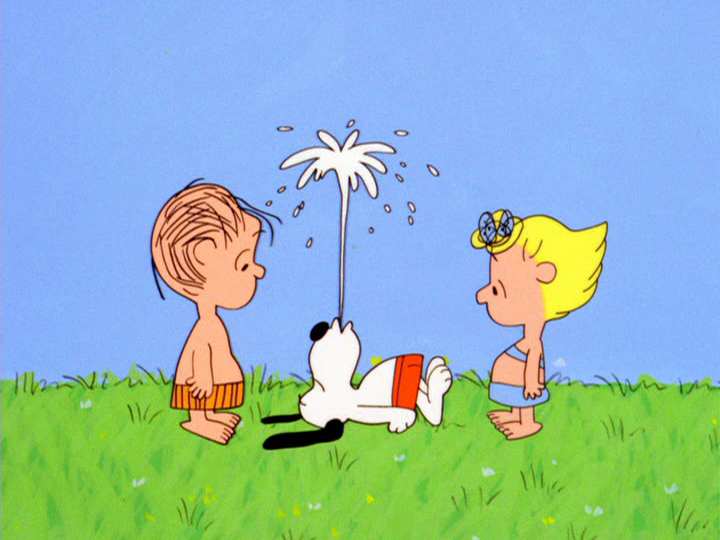 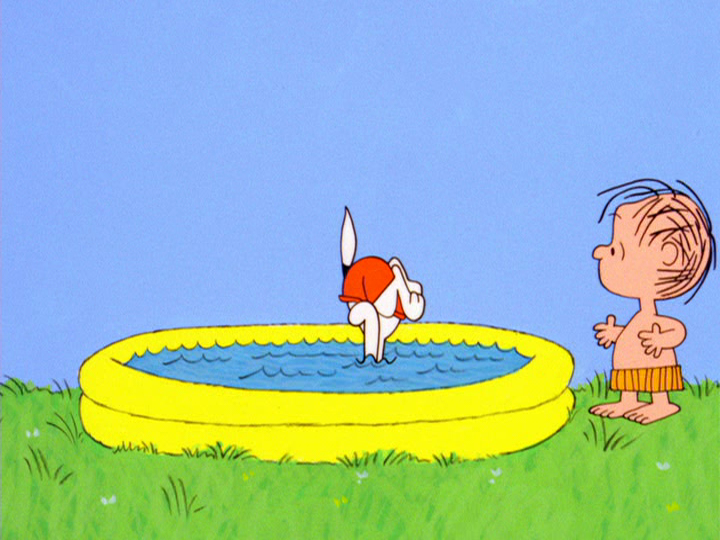 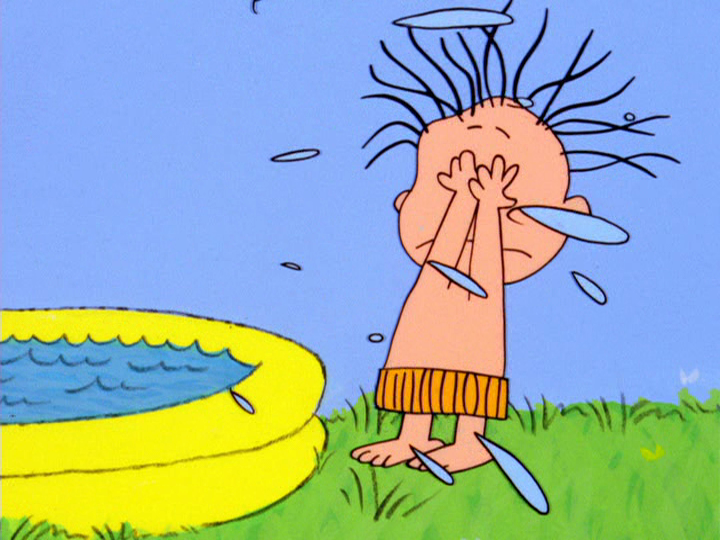 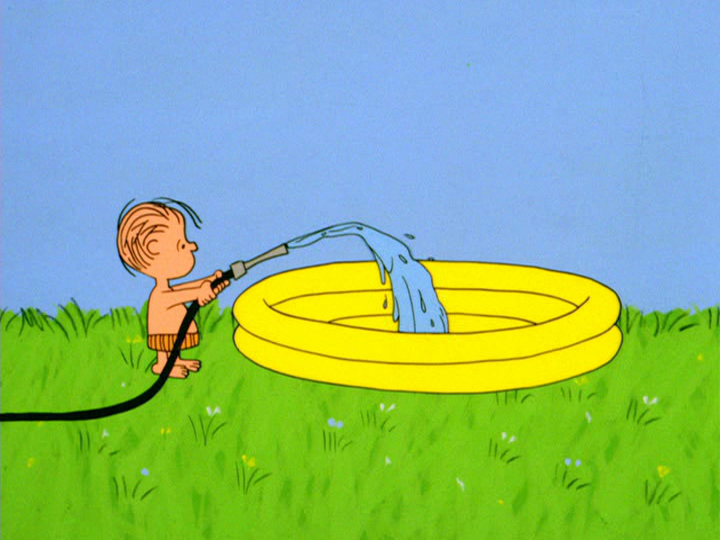 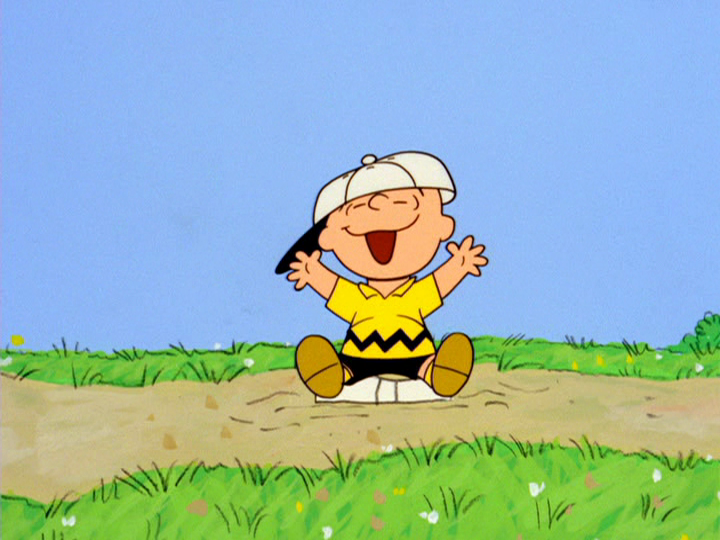 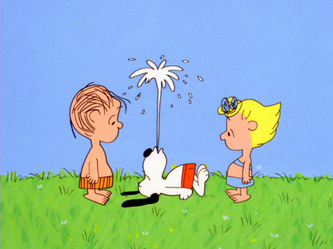 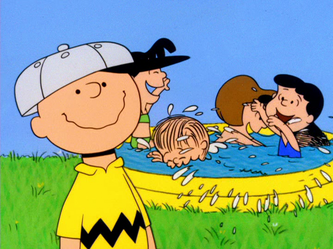 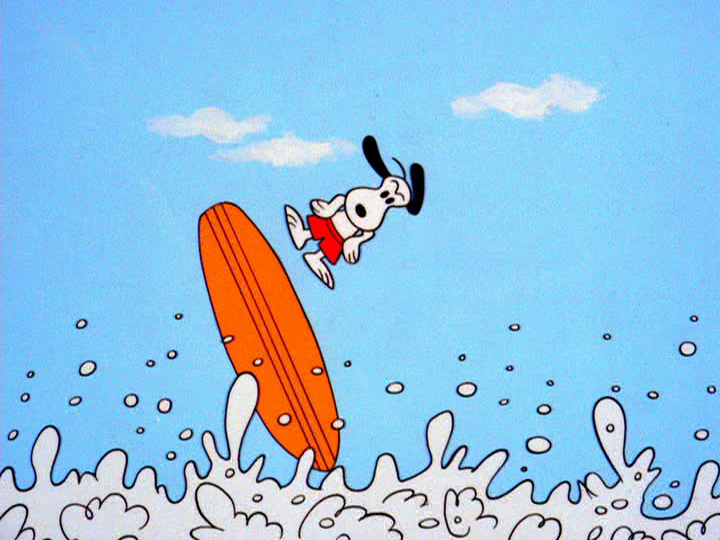 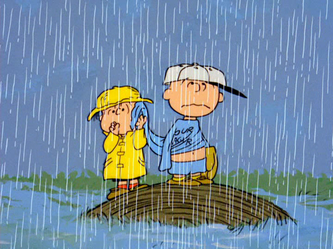 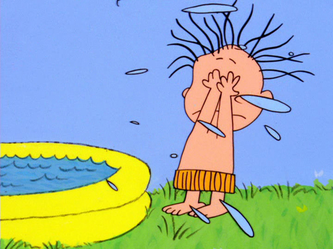 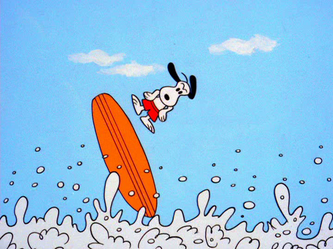 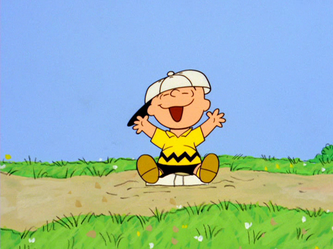 Charlie Brown loves it, of course. 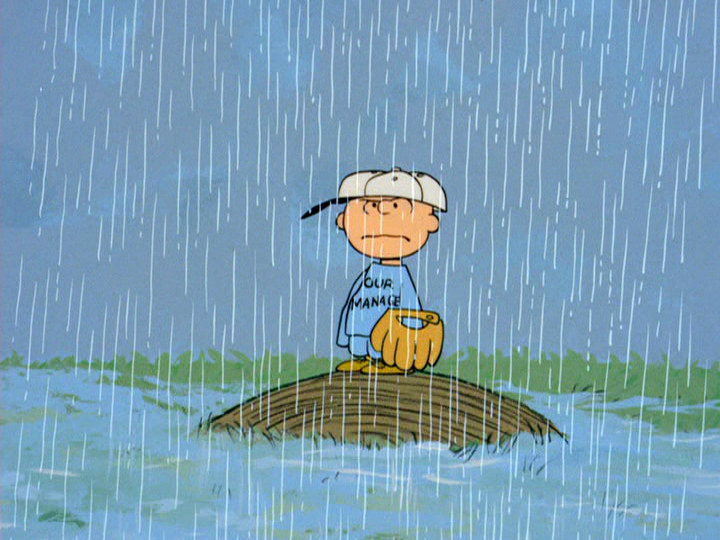 The next day, he is outside, in the rain, expecting to play ball. 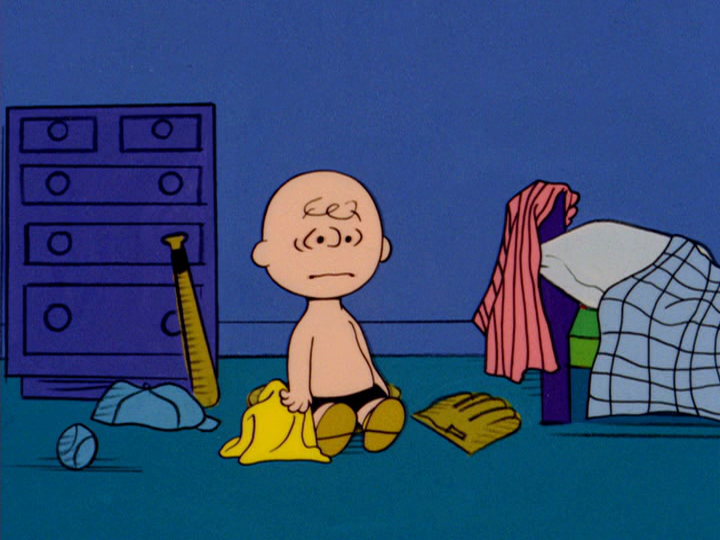 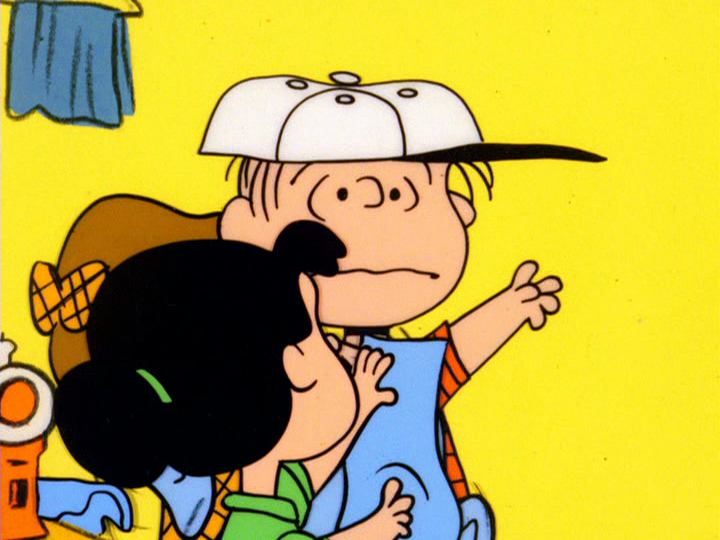 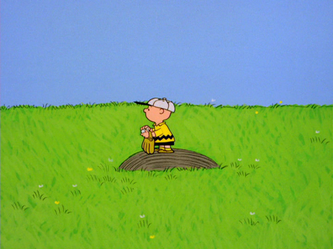 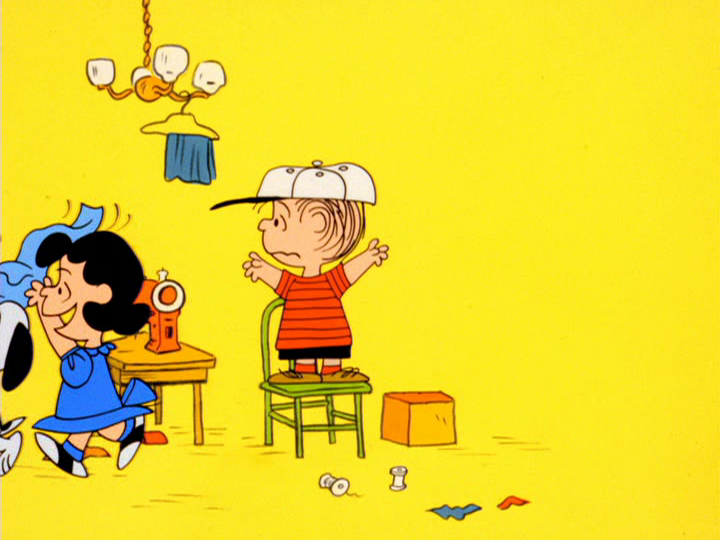 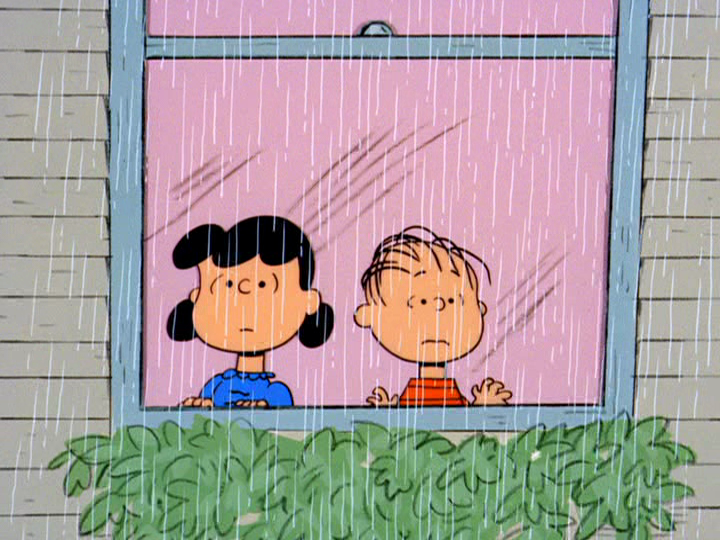 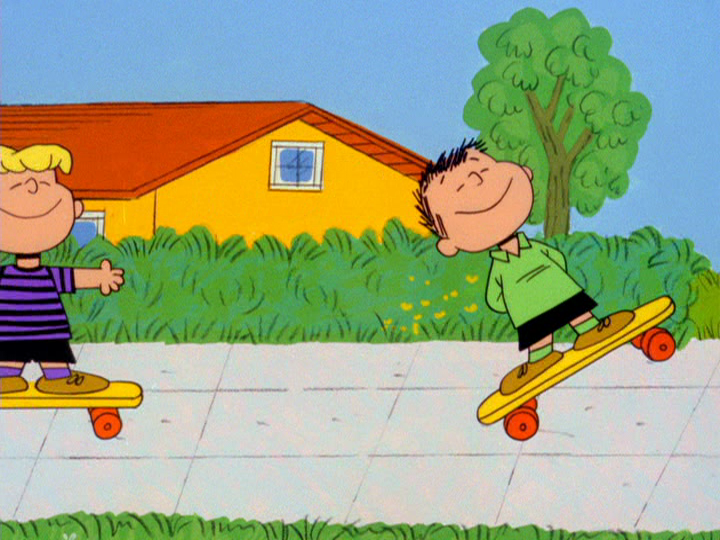 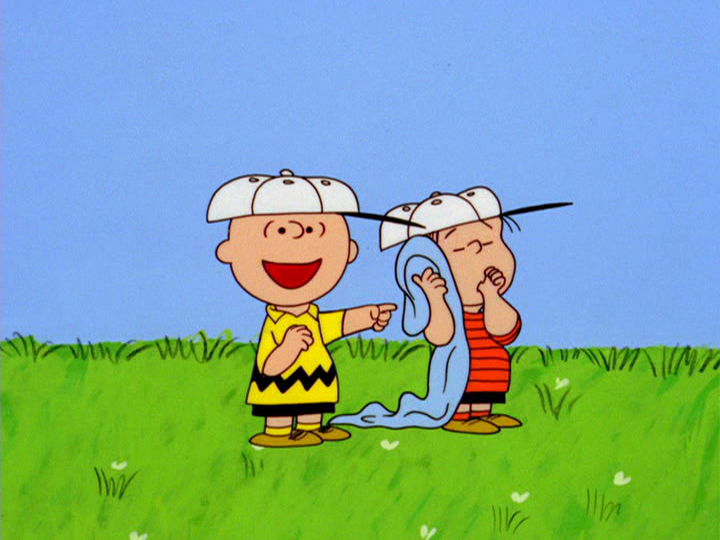 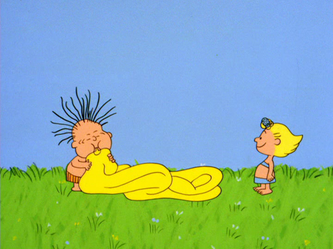 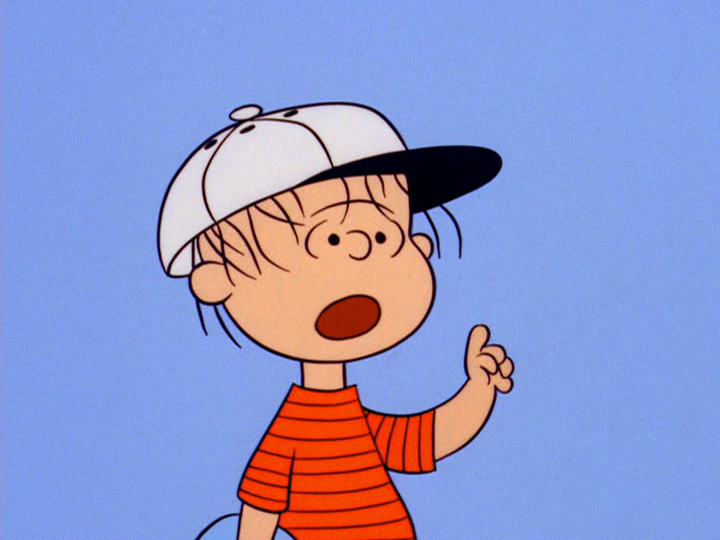 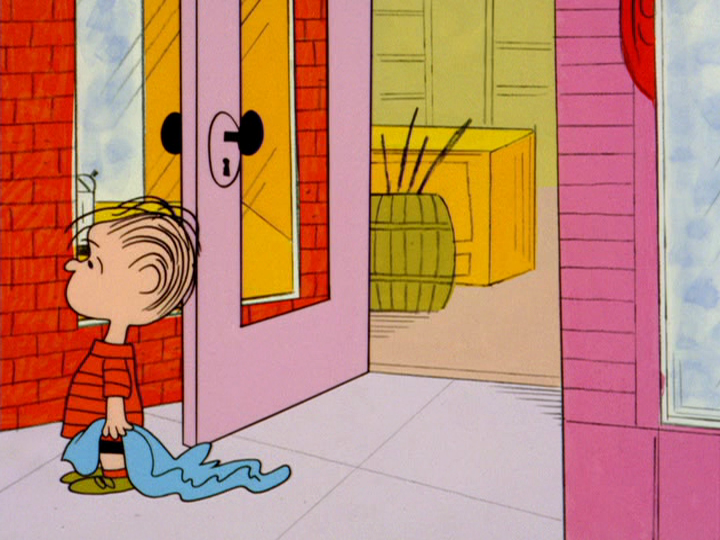 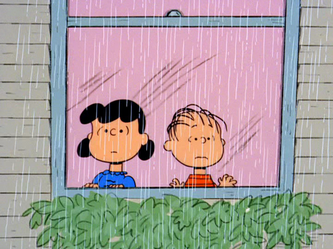 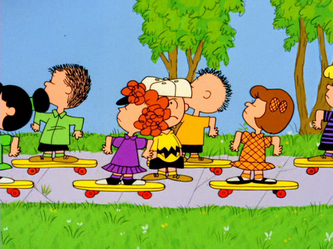 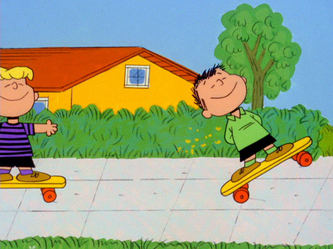 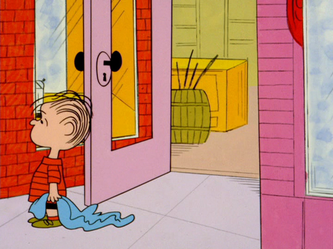 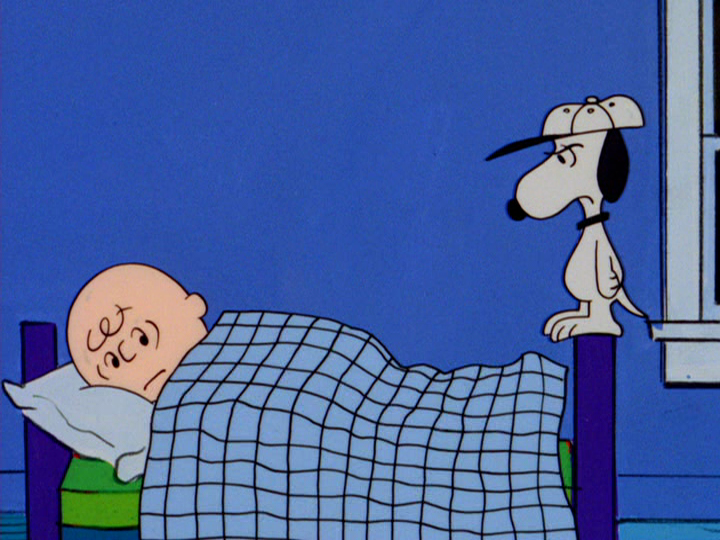 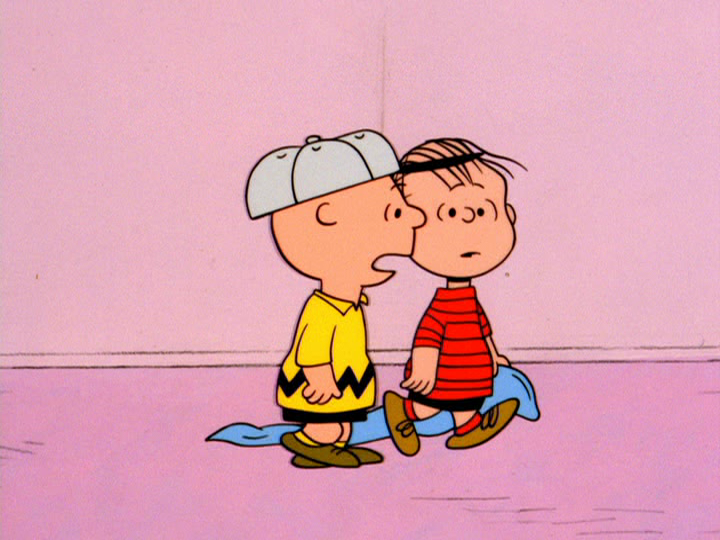 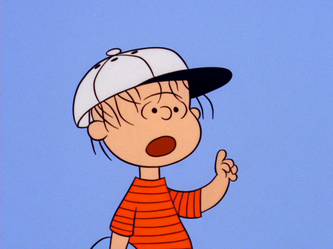 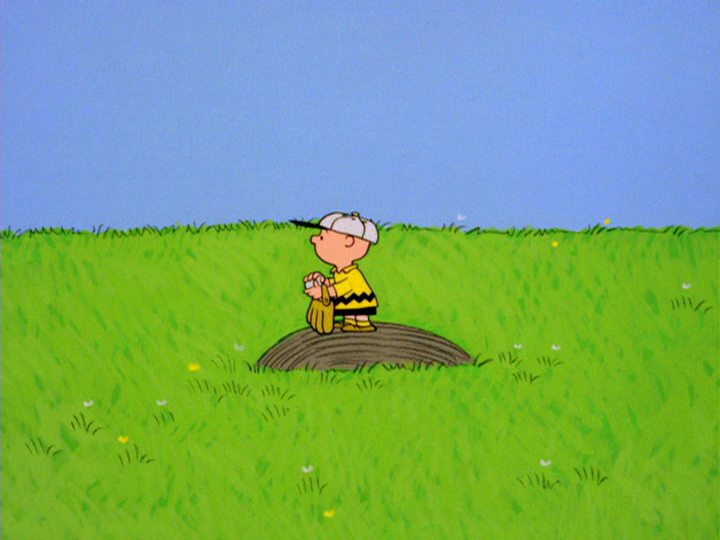 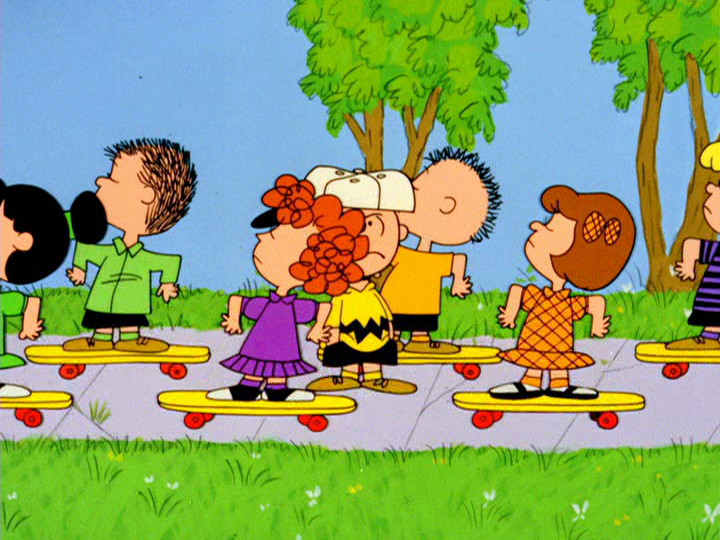 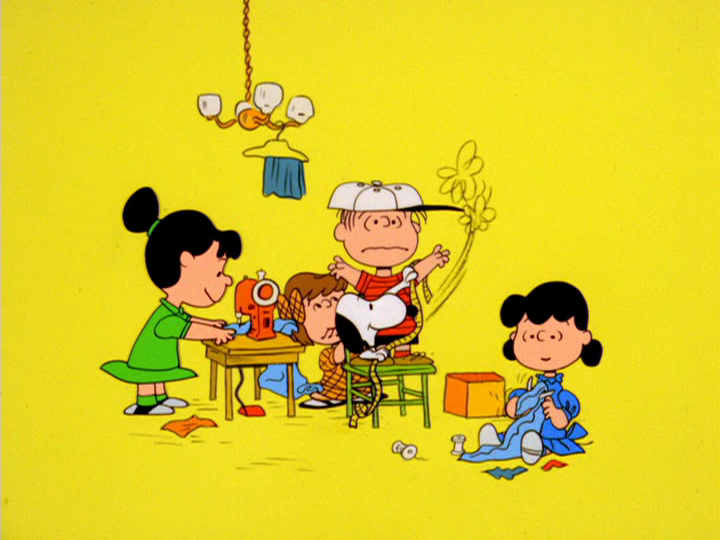 No one else shows up, so Linus goes out to see him and tells him that no one's coming, and that his blanket is Charlie Brown's uniform. 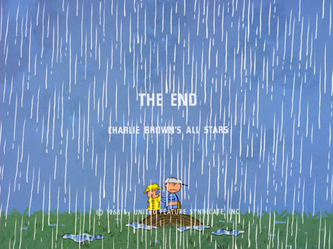 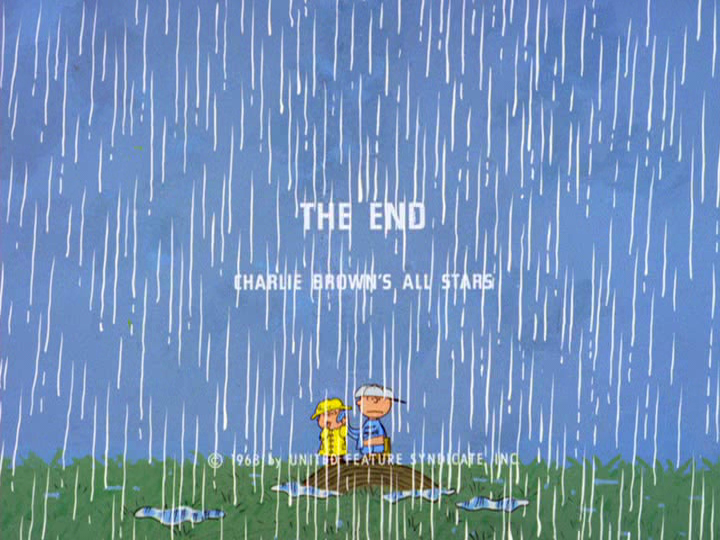 The special ends with the two friends standing together in the rain.